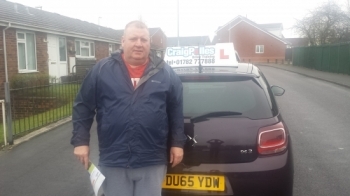 Driving lessons with Craig Polles will help you PASS 1ST TIME! 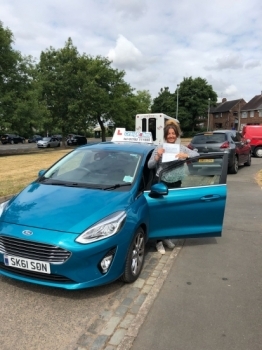 A big congratulations to Kim Yates, who has passed her driving test today at Cobridge Driving Test Centre, on her First attempt and with just 2 driver faults. 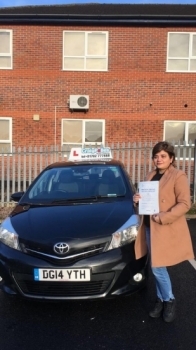 A big congratulations to Uzma Afzal, who has passed her driving test today at Cobridge Driving Test Centre, on her First attempt and with just 4 driver faults. 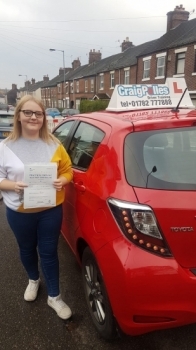 A big congratulations to Chloe Stanyer, who has passed her driving test today at Newcastle Driving Test Centre, on her First attempt and with 8 driver faults. 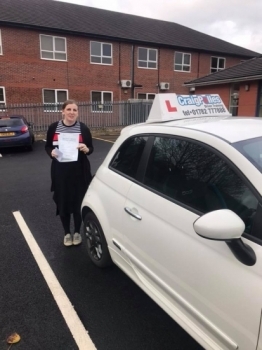 A big congratulations to Rachel Pover, who has passed her driving test today at Newcastle Driving Test Centre, on her First attempt and with just 4 driver faults. 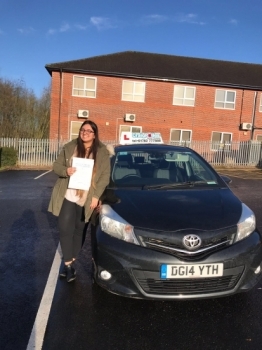 A big congratulations to Estela Sanchez, who has passed her driving test today at Newcastle Driving Test Centre, with just 6 driver faults. 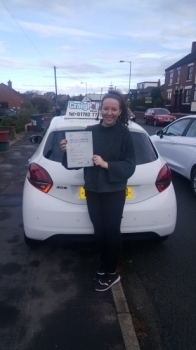 A big congratulations to Emily Tunnicliffe, who has passed her driving test today at Newcastle Driving Test Centre, with just 6 driver faults. 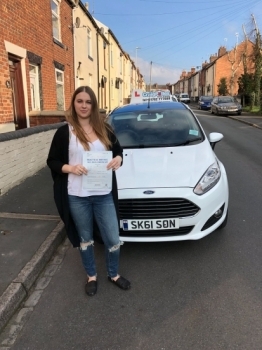 A big congratulations to Jess Mountford, who has passed her driving test today at Cobridge Driving Test Centre, on her First attempt and with just 5 driver faults. 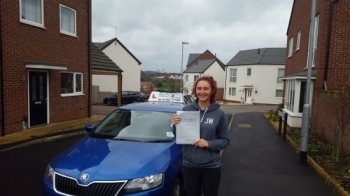 A big congratulations to Jay Steele, who has passed her driving test today at Cobridge Driving Test Centre, with just 4 driver faults. 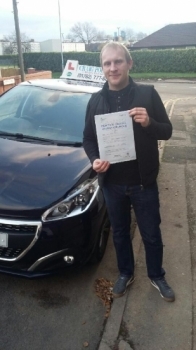 A big congratulations to Matt Meakin, who has passed his driving test today at Cobridge Driving Test Centre, with just 5 driver faults. 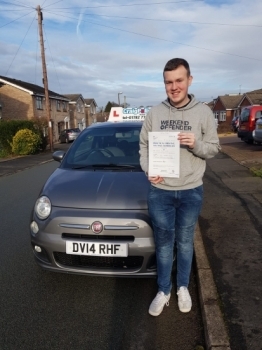 A big congratulations to Cameron Rew, who has passed his driving test today at Cobridge Driving Test Centre, with just 5 driver faults. 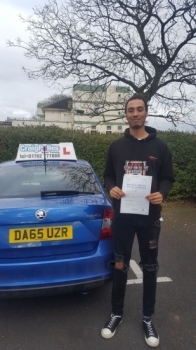 A big congratulations to Dante Omfroy, who has passed his driving test today at Newcastle Driving Test Centre, on his First attempt and with 6 driver faults. 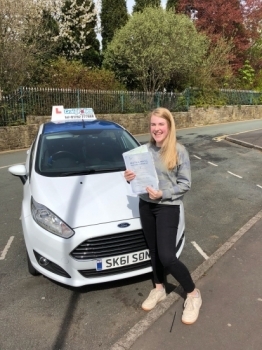 A big congratulations to Annie Tomy, who has passed her driving test today at Buxton Driving Test Centre, with 8 driver faults. 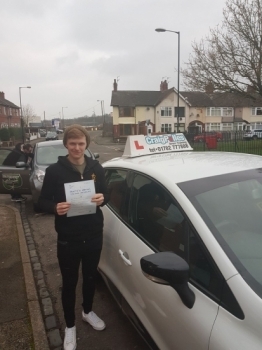 A big congratulations to Jake Peake, who has passed his driving test today at Cobridge Driving Test Centre, on his First attempt and with just 4 driver faults. 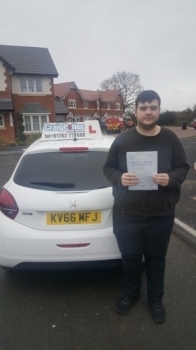 A big congratulations to Patrick Brewer, who has passed his driving test today at Crewe Driving Test Centre, on his First attempt and with just 3 driver faults. 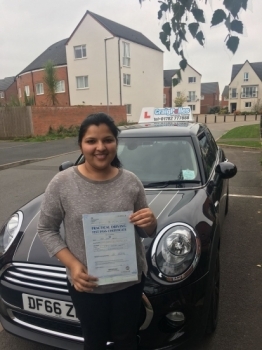 A big congratulations to Leena George, who has passed her driving test today at Newcastle Driving Test Centre, with just 6 driver faults. 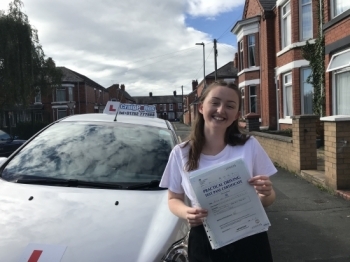 A big congratulations to Ellie Martin, who has passed her driving test at Newcastle Driving Test Centre, on her First attempt and with just 3 driver faults. 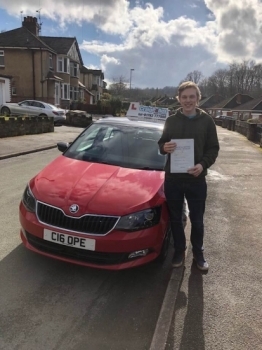 A big congratulations to Will Dykes, who has passed his driving test today at Cobridge Driving Test Centre, on his First attempt and with just 3 driver faults. 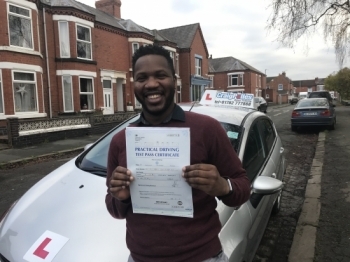 A big congratulations to Gilbert Oris, who has passed his driving test today at Newcastle Driving Test Centre, with just 3 driver faults. 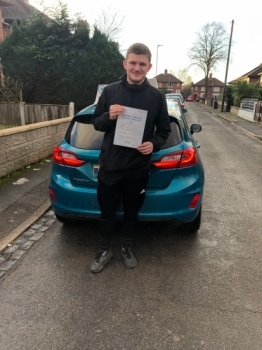 A big congratulations to Jake Hall, who has passed his driving test today at Cobridge Driving Test Centre, on his First attempt and with just 6 driver faults. 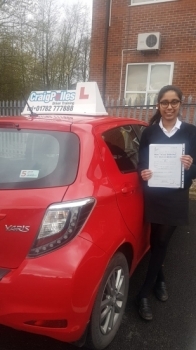 A big congratulations to Avani Chavan, who has passed her driving test today at Newcastle Driving Test Centre, with just 4 driver faults. 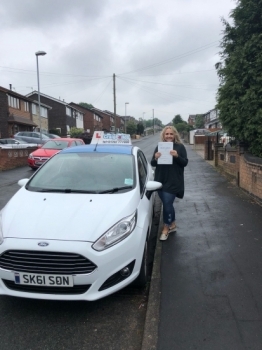 A big congratulations to Teri Smith, who has passed her driving test at Cobridge Driving Test Centre, on her First attempt and with just 3 driver faults. 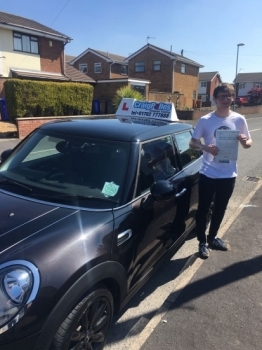 A big congratulations to Will Edwards, who has passed his driving test at Newcastle Driving Test Centre, on his First attempt and with just 6 driver faults. 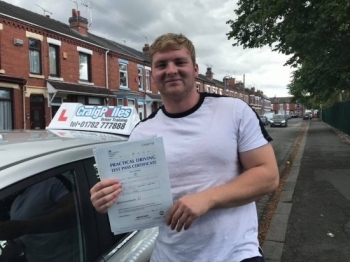 A big congratulations to Scott Bebbington, who has passed his driving test at Crewe Driving Test Centre, on his First attempt. 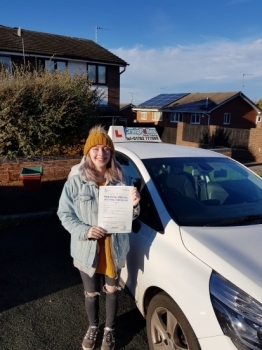 A big congratulations to kaisey Atherton, who has passed her driving test today at Cobridge Driving Test Centre, on her First attempt and with just 4 driver faults. 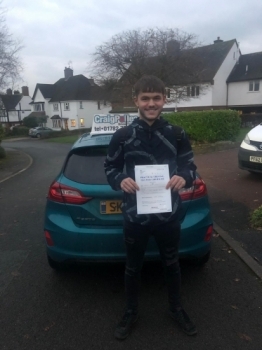 A big congratulations to Harry Fowell, who has passed his driving test at Cobridge Driving Test Centre, on his First attempt and with just 3 driver faults. 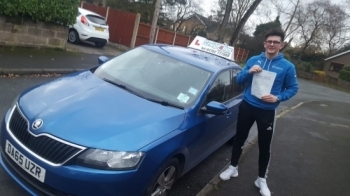 A big congratulations to George Bradley, who has passed his driving test at Cobridge Driving Test Centre, on his First attempt and with just 2 driver faults. 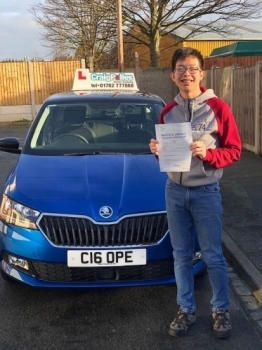 A big congratulations to Henry Wong, who has passed his driving test today at Newcastle Driving Test Centre, with just 3 driver faults. 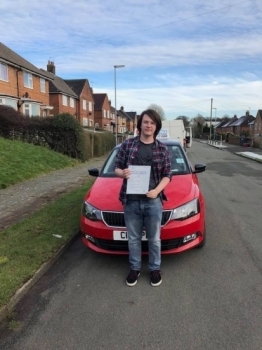 A big congratulations to Alex Edgington, who has passed his driving test today at Cobridge Driving Test Centre, on his First attempt and with just 3 driver faults. 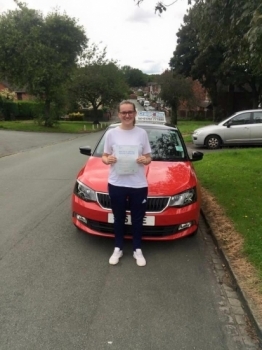 A big congratulations to Molly Nicklin, who has passed her driving test today at Newcastle Driving Test Centre. 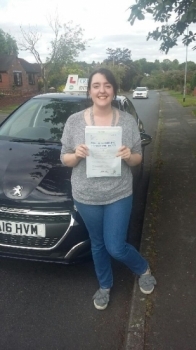 A big congratulations to Jhelene Goodfellow, who has passed her driving test today at Cobridge Driving Test Centre. with just 5 driver faults. 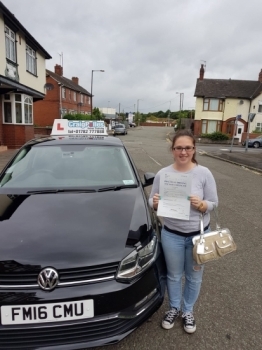 A big congratulations to Amy Worth, who has passed her driving test today at Cobridge Driving Test Centre, on her First attempt and with just 3 driver faults. 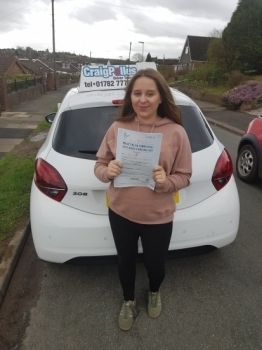 A big congratulations to Jazmyn Clutton-Smikle, who has passed her driving test today at Cobridge Driving Test Centre, on her First attempt and with 7 driver faults. 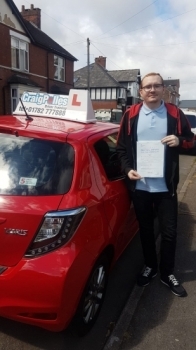 A big congratulations to Richard Parkes, who has passed his driving test today at Newcastle Driving Test Centre, on his First attempt and with just 3 driver faults. with just 3 driver faults. 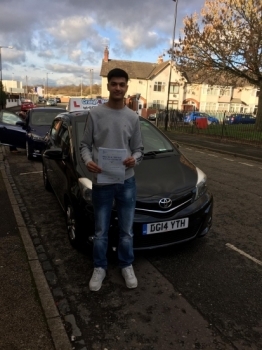 A big congratulations to Anser Mahmood, who has passed his driving test today at Cobridge Driving Test Centre, at his First attempt and with 0 driver faults. 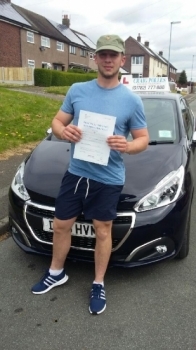 A big congratulations to James Robson, who has passed his driving test today at Newcastle Driving Test Centre, with just 6 driver faults. 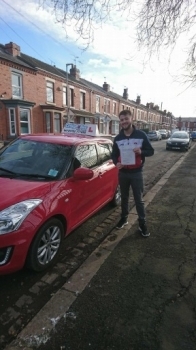 A big congratulations to Zack Devaney, who has passed his driving test today at Newcastle Driving Test Centre, on his First attempt. 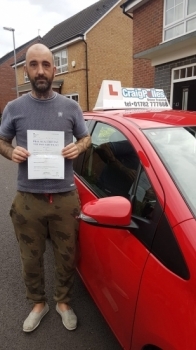 A big congratulations to Mike turner, who has passed his driving test today at Cobridge Driving Test Centre, with just 3 driver faults. 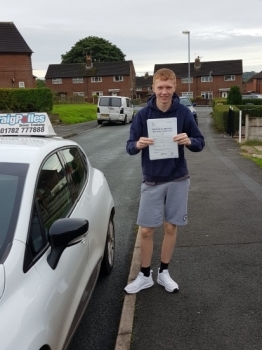 A big congratulations to Sam Twigg, who has passed his driving test today at Newcastle Driving Test Centre, on his First attempt. 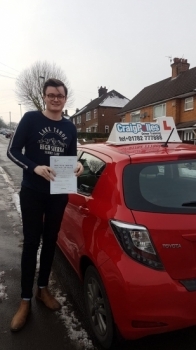 A big congratulations to Ben Creasy, who has passed his driving test today at Cobridge Driving Test Centre, on his First attempt and with just 3 driver faults. 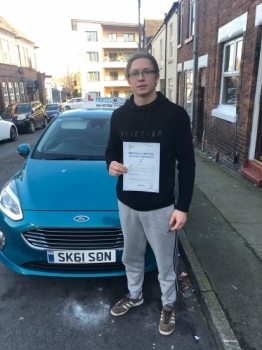 A big congratulations to Louis Wetton, who has passed his driving test today at Newcastle Driving Test Centre, with 6 driver faults. 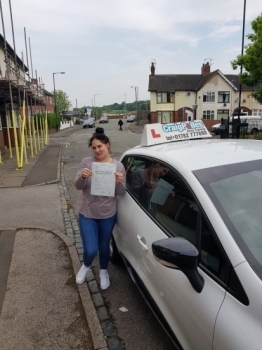 A big congratulations to a camera shy Natalie Forte, who has passed her driving test at Crewe Driving Test Centre, on her First attempt. 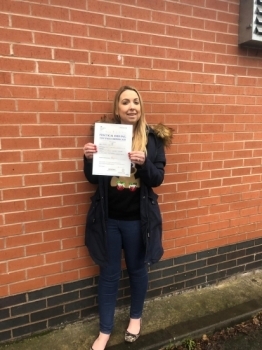 A big congratulations to Tara Parkes, who has passed her driving test today at Newcastle Driving Test Centre, with 6 driver faults. 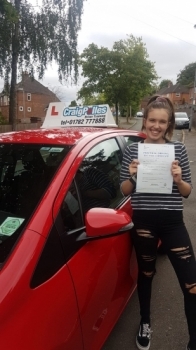 A big congratulations to Emily Long, who has passed her driving test today at Cobridge Driving Test Centre, with just 1 driver fault. 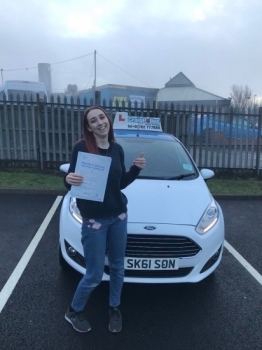 A big congratulations to Sophie Taylor, who has passed her driving test today at Newcastle Driving Test Centre, on her First attempt and with just 3 driver faults. 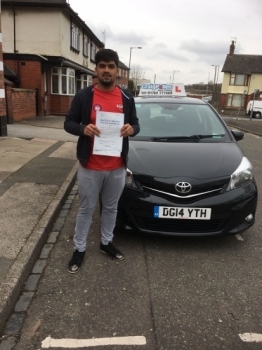 A big congratulations to Sayaab Ali, who has passed his driving test today at Cobridge Driving Test Centre, on his First attempt and with just 4 driver faults. 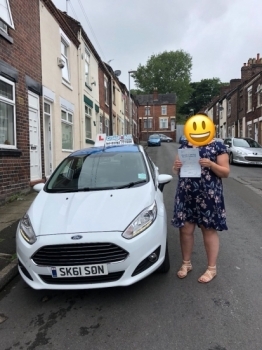 A big congratulations to Louisa Morley, who has passed her driving test today at Newcastle Driving Test Centre, on her First attempt and with just 4 driver faults. 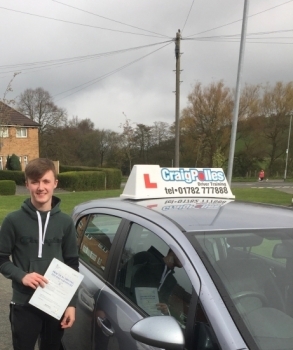 A big congratulations to Charlie Markey, who has passed his driving test today at Newcastle Driving Test Centre, with just 3 driver faults. 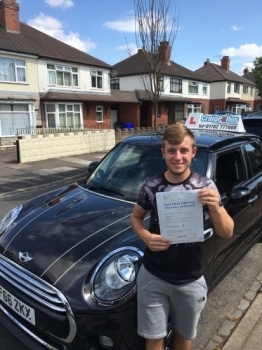 A big congratulations to Bradley Edwards, who has passed his driving test today at Newcastle Driving Test Centre, with just 5 driver faults. 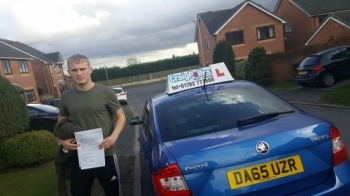 A big congratulations to Wilf Morris, who has passed his driving test today at Newcastle Driving Test Centre. First attempt and with just 5 driver faults. 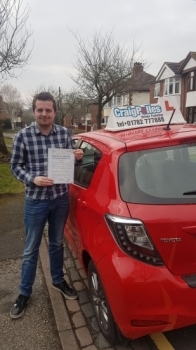 A big congratulations to Edward Stokes, who has passed his driving test today at Crewe Driving Test Centre, with 6 driver faults. 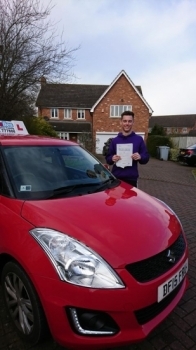 A big congratulations to Matt Brundrett, who has passed his driving test today with just 3 driver faults. 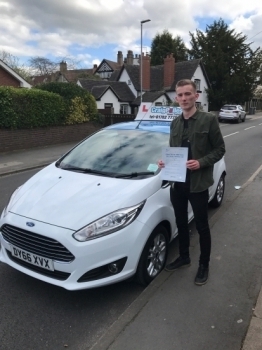 A big congratulations to Joe Eaton, who has passed his driving test at Cobridge Driving Test Centre, with just 1 driver fault. 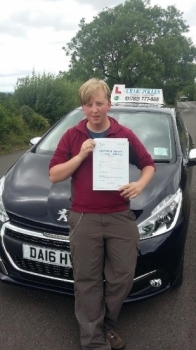 A big congratulations to Kyle Walton, who has passed his driving test today at Cobridge Driving Test Centre. First attempt and with just 4 driver fault. 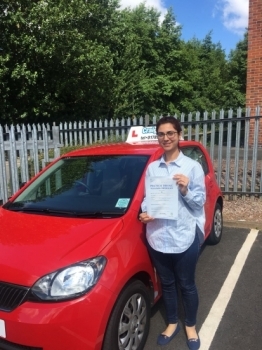 A big congratulations to Dr Ayesha Chaudhry, who has passed her driving test today at Buxton Driving Test Centre, with just 4 driver faults. 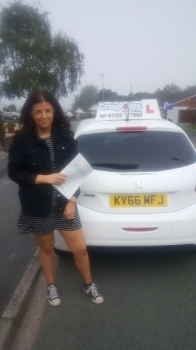 A big congratulations to Sasha Slight, who has passed her driving test at Crewe Driving Test Centre, with just 4 driver faults. 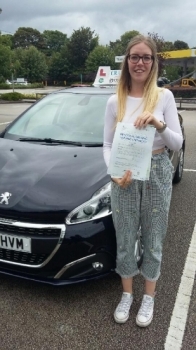 A big congratulations to Imogen Allen, who has passed her driving test today at Newcastle Driving Test Centre, with 7 driver faults. 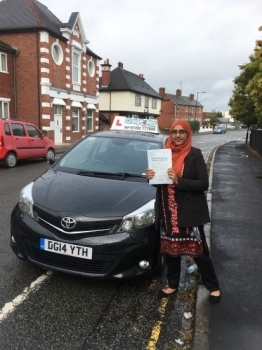 A big congratulations to Mrs Hina Ammir, who has passed her driving test toady at Newcastle Driving Test Centre. First attempt and with just 3 driver faults. 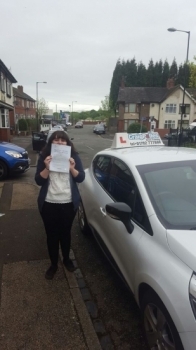 A big congratulations to Tara Neal, who has passed her driving test today at Crewe Driving Test Centre. First attempt and with 7 driver faults. 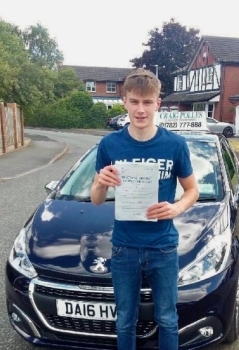 A big congratulations to Josh Priestman, who has passed his driving test today at Crewe Driving Test Centre. 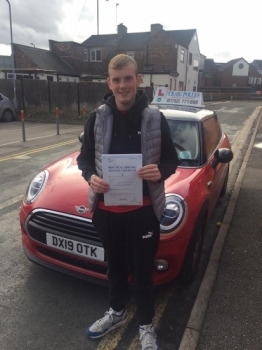 A big congratulations to Levi Sherwood, who has passed his driving test today at Cobridge Driving Test Centre. 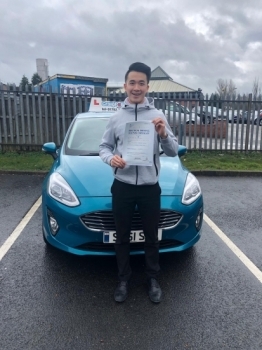 A big congratulations to Matthew Chau, who has passed his driving test toady at Cobridge Driving Test Centre. 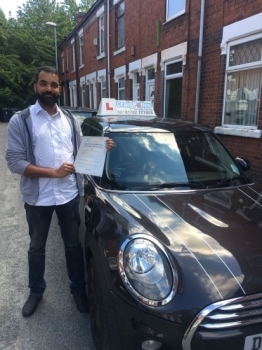 A big congratulations to Dr Nadir Kiddo, who has passed his driving test today at Buxton Driving Test Centre. 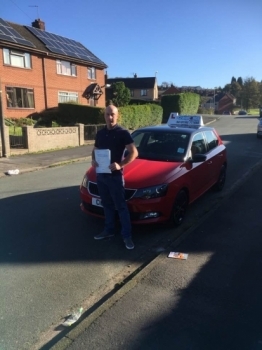 A massive congratulations goes to Jason Cook, who passed his ADI Part 3 test at his first attempt - Cobridge Test Centre. 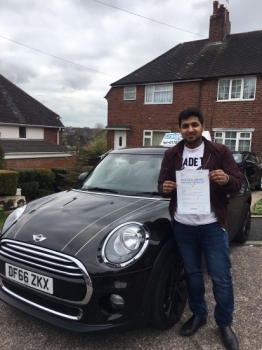 A big congratulations to Mohammad Fayyaz, who has passed his driving test toady at Cobridge Driving Test Centre. First attempt and with just 6 driver faults. 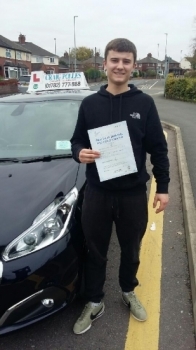 A big congratulations to Alex Gratty, who has passed his driving test toady at Cobridge Driving Test Centre. First attempt and with just 1 driver fault. 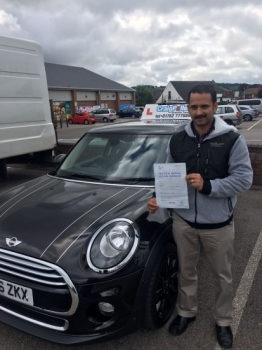 A big congratulations to Moqqadus Tabassum, who has passed his driving test today at Cobridge Driving Test Centre, with 4 driver faults. 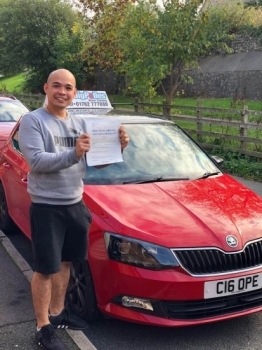 A big congratulations to Dr. Joachim Jimie, who has passed his driving test at Crewe Driving Test Centre. 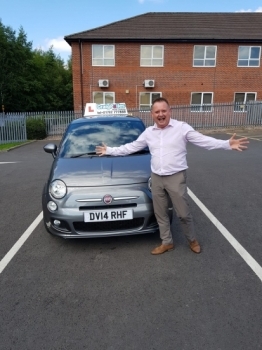 A big congratulations to Darran Vickery, who has passed his driving test today at Newcastle Driving Test Centre, on his First attempt and with just 5 driver faults. 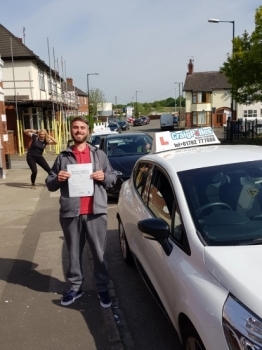 A big congratulations to Glen Parrish, who has passed his driving test today at Newcastle Driving Test Centre, on his First attempt and with 6 driver faults. 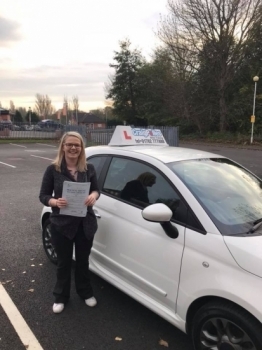 A big congratulations to Elizabeth Keay, who has passed her driving test today at Newcastle Driving Test Centre, on her First attempt and with just 2 driver faults. 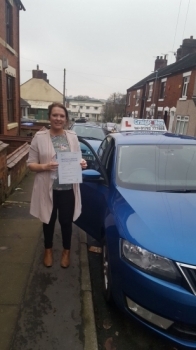 A big congratulations to Jayne Welch, who has passed her driving test today at Newcastle Driving Test Centre, on her First attempt and with 8 driver faults. 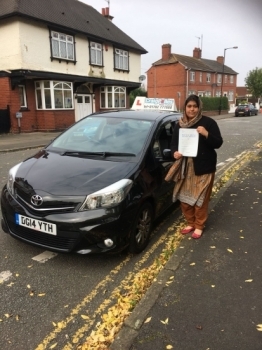 A big congratulations to Sidra Fatima, who has passed her driving test today at Cobridge Driving Test Centre, with 6 driver faults. 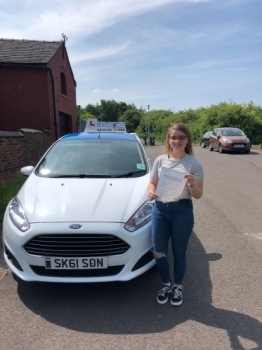 A big congratulations to Sophie Dobbin, who has passed her driving test today at Newcastle Driving Test Centre, on her First attempt and with just 3 driver faults. 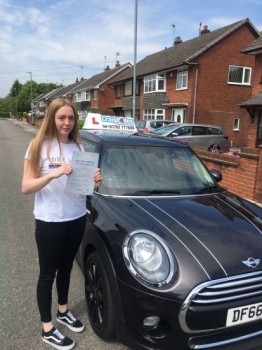 A big congratulations to Niamh Hogg, who has passed her driving test at Cobridge Driving Test Centre. 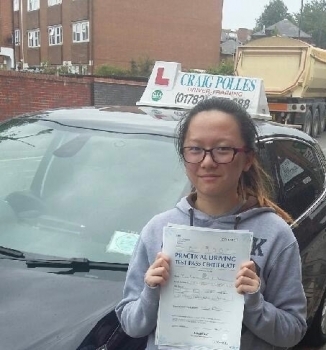 At her First attempt and with just 6 driver faults. 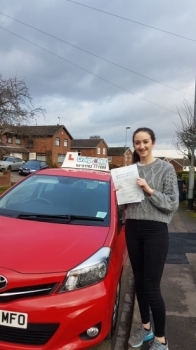 A big congratulations to Sophie Harris, who has passed her driving test at Cobridge Driving Test Centre. 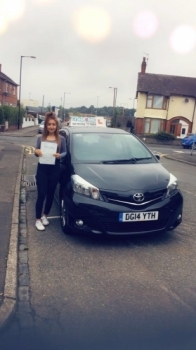 At her First attempt and with just 4 driver faults. 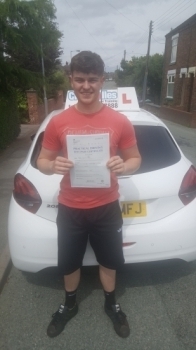 A big congratulations to Anthony Owens, who has passed his driving test today at Crewe Driving Test Centre. First attempt and with just 4 driver faults. 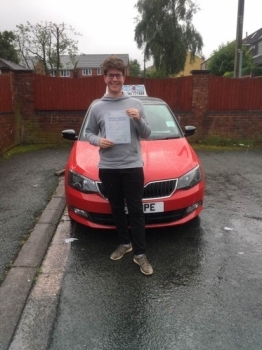 A big congratulations to Connor Herbert-Jackson, who has passed his driving test today at Crewe Driving Test Centre. 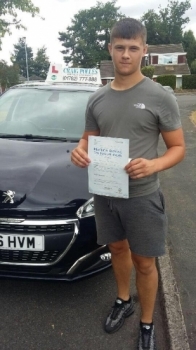 A big congratulations to Will Jones, who has passed his driving test today at Newcastle Driving Test Centre, on his First attempt and with just 5 driver faults. 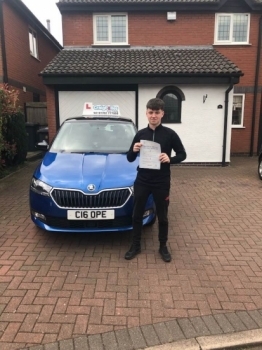 A big congratulations to Oliver Morgan, who has passed his driving test today at Newcastle Driving Test Centre, on her First attempt and with 7 driver faults. 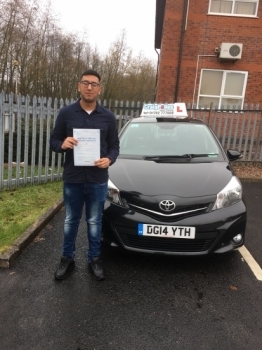 A big congratulations to Muhammad Umar Hashmi, who has passed his driving test today at Newcastle Driving Test Centre, with just 1 driver fault. 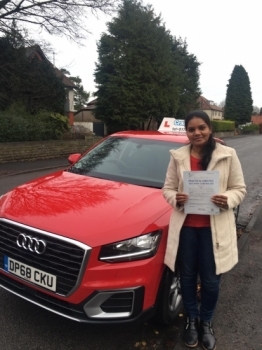 A big congratulations to Seetha Rinil, who has passed her driving test today at Buxton Driving Test Centre, on her First attempt and with 7 driver faults. 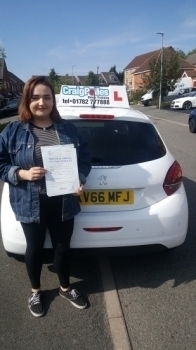 A big congratulations to Jade Forsyth, who has passed her driving test today at Cobridge Driving Test Centre, with 6 driver faults. 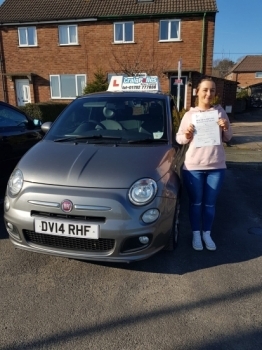 A big congratulations to Laetitia Efori, who has passed her driving test today at Newcastle Driving Test Centre, at her First attempt and with just 6 driver faults. 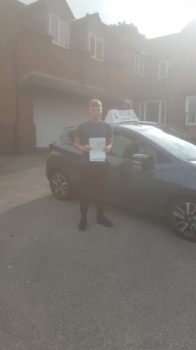 A big congratulations to Nathan Lowndes, who has passed his driving test today at Cobridge Driving Test Centre, at his First attempt and with just 1 driver fault. 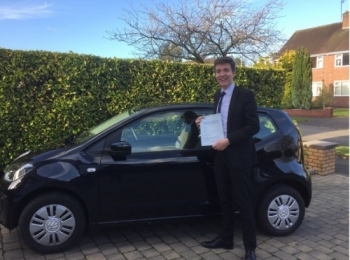 A big congratulations to Will Ward, who has passed his driving test at Newcastle Driving Test Centre. 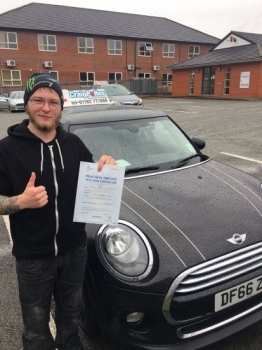 At his First attempt and with just 2 driver faults. 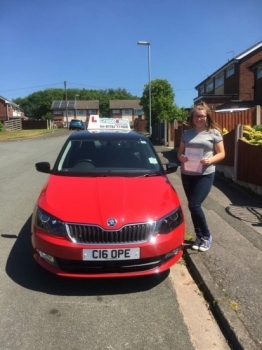 A big congratulations to Leanne Tennison, who has passed her driving test at Crewe Driving Test Centre, at her First attempt. 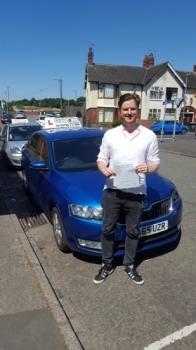 A big congratulations to Andrew Mercer, who has passed his driving test today at Cobridge Driving Test Centre, with 9 driver faults. 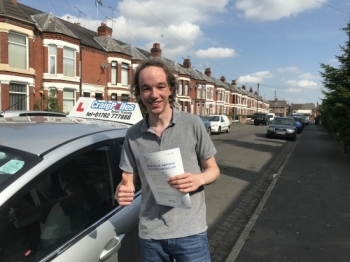 A big congratulations to Thomas Humphries, who has passed his driving test today at Crewe Driving Test Centre, with 6 driver faults. 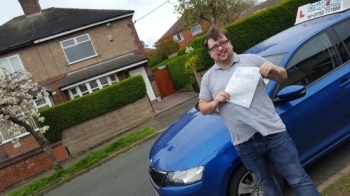 A big congratulations to Chris Hopley, who has passed his driving test today at Cobridge Driving Test Centre, with just 5 driver faults. 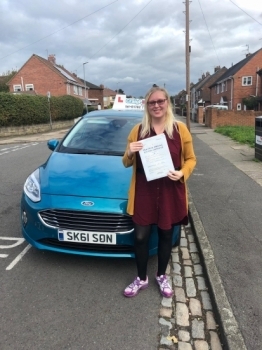 A big congratulations to Katie Figin, who has passed her driving test at Cobridge Driving Test Centre. 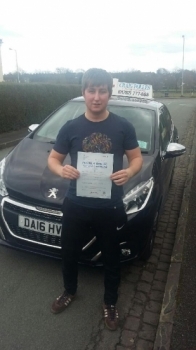 A big congratulations to Adam Thomas, who has passed his driving test today Cobridge Driving Test Centre, with 6 driver faults. 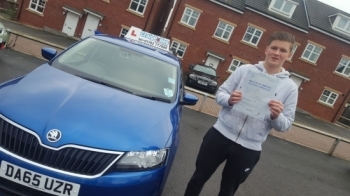 A big congratulations to Tom Hossack, who has passed his driving test today at Newcastle Driving Test Centre. 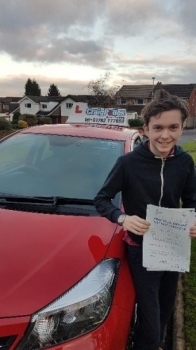 A big congratulations to Ben Whitmore, who has passed his driving test at Cobridge Driving Test Centre. 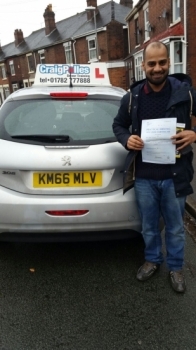 At his First attempt and with just 5 driver faults. 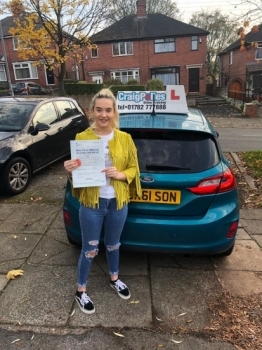 A big congratulations to Georgia Hodges, who has passed her driving test today at Newcastle Driving Test Centre with just 4 driver faults. 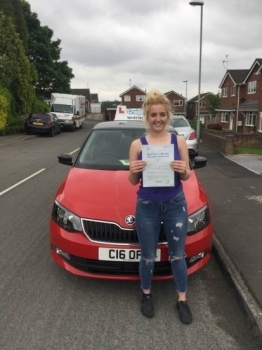 A big congratulations to Cayleigh Rodgers, who has passed her driving test today at Newcastle Driving Test Centre. 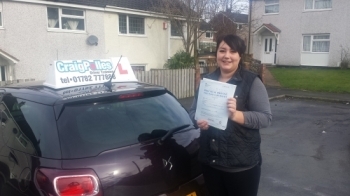 A big congratulations to Tanya Hopwood, who has passed her driving test today at Newcastle Driving Test Centre. 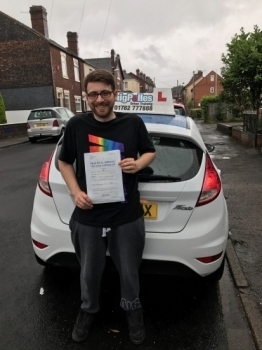 A big congratulatio Alex Minshull, who has passed his driving test today at Newcastle Driving Test Centre, with just 5 driver faults. 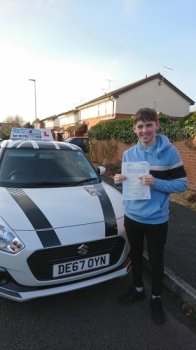 A big congratulations to Davin Ward, who has passed his driving test at Cobridge Driving Test Centre. 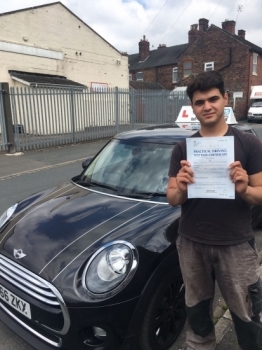 At his First attempt and with just 2 driver faults. 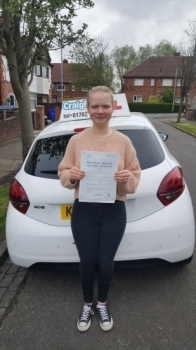 A big congratulations to Amelia-Lea Brammer, who has passed her driving test today at Newcastle Driving Test Centre, with 6 driver faults. 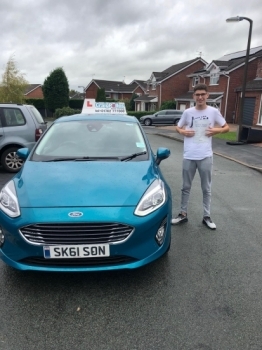 A big congratulations to Nathan Feltcher, who has passed his driving test at Crewe Driving Test Centre. At his first attempt . 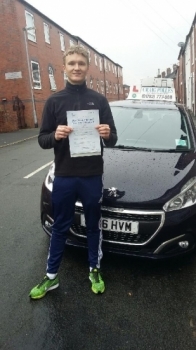 A big congratulations to Jacob Droogmans, who has passed his driving test today at Newcastle Driving Test Centre. 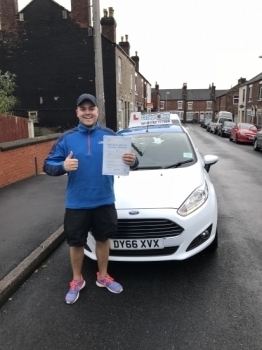 A big congratulations to Tom Maddox, who has passed his driving test today at Newcastle Driving Test Centre, with 7 driver faults. 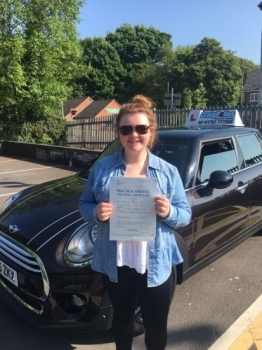 A big congratulations to Charlie Betley, who has passed her driving test today at Newcastle Driving Test Centre. 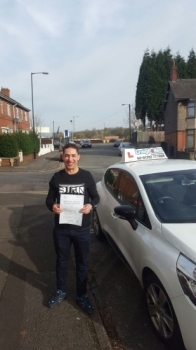 A big congratulations to Adrian Stefan, who has passed his driving test today at Cobridge Driving Test Centre. First attempt and with 6 just driver faults. 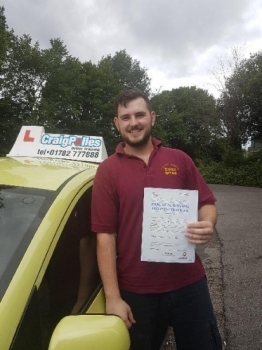 A big congratulations to Ben Cater, who has passed his driving test today at Cobridge Driving Test Centre, with just 5 driver faults. 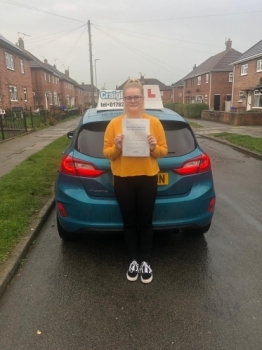 A big congratulations to Hannah Daley, who has passed her driving test today at Newcastle Driving Test Centre. 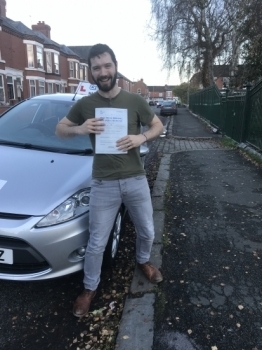 A big congratulations to David Calcott, who has passed his driving test today at Newcastle Driving Test Centre, with 8 driver faults. 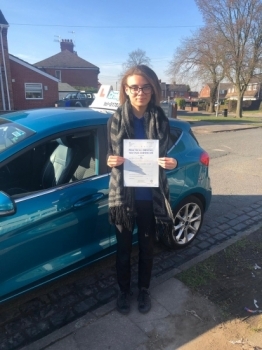 A big congratulations to Yasmin Quick, who has passed her driving test today at Newcastle Driving Test Centre. 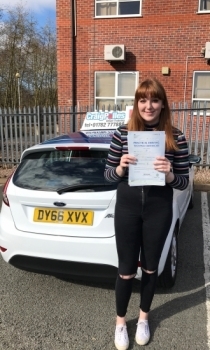 A big congratulations to Bethany Leese, who has passed her driving test today at Newcastle Driving Test Centre, with 7 driver faults. 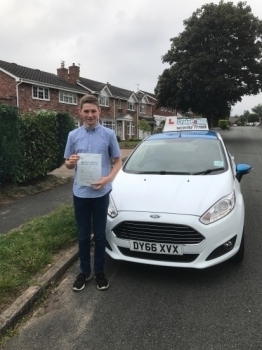 A big congratulations to Bailey Hamer, who has passed his driving test today at Cobridge Driving Test Centre, with just 1 driver fault. 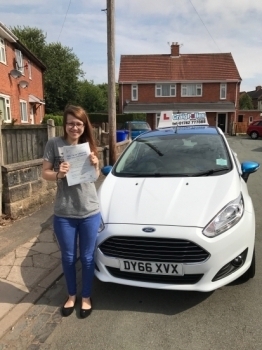 A big congratulations to Lauren Pattie, who has passed her driving test today at Cobridge Driving Test Centre. 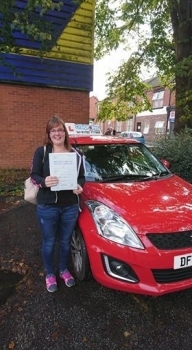 A big congratulations to Karen Hitchen, who has passed her driving test today at Crewe Driving Test Centre. 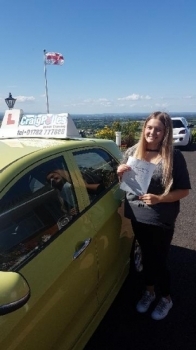 A big congratulations to Frankie Lawrence, who has passed her driving test today at Cobridge Driving Test Centre, with just 4 driver faults. 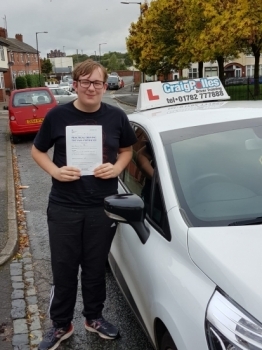 A big congratulations to Ellis Bairstow, who has passed his driving test today at Crewe Driving Test Centre, with 4 driver faults. 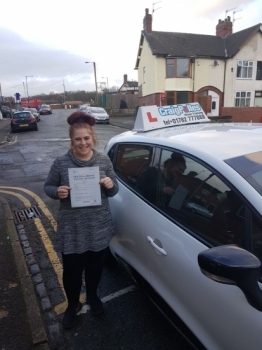 A big congratulations to Alicia Arnold, who has passed her driving test today at Newcastle Driving Test Centre. 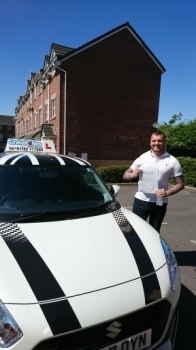 A big congratulations to Matt Cureton, who has passed his driving test today at Newcastle Driving Test Centre. First attempt and with just 2 driver faults. 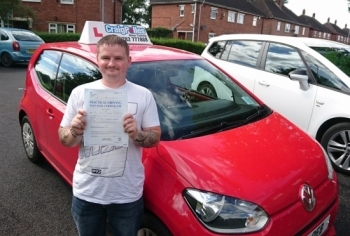 A big congratulations to Daz, who has passed his driving test at Cobridge Driving Test Centre at his First attempt. 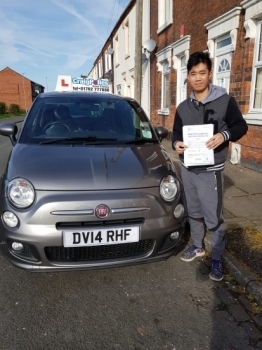 A big congratulations to Jerry Chan, who has passed his driving test toady at Cobridge Driving Test Centre. 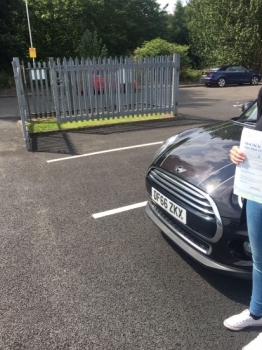 A big congratulations to Mia Grocott, who has passed her driving test today at Newcastle Driving Test Centre. 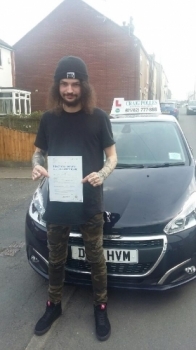 A big congratulations to Devon Johnson, who has passed his driving test at Newcastle Driving Test Centre, with just 3 driver faults. 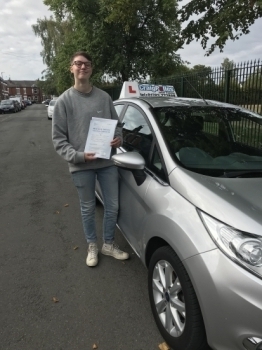 A big congratulations to Eathon Bowker, who has passed his driving test at Newcastle Driving Test Centre, with just 5 driver faults. 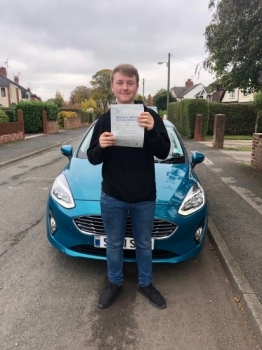 A big congratulations to Josh Allock, who has passed his driving test today at Cobridge Driving Test Centre, at his First attempt and with 0 driver faults. 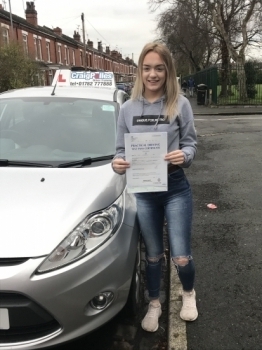 A big congratulations to Zoey Walsh, who has passed her driving test today at Newcastle Driving Test Centre, with just 5 driver faults. 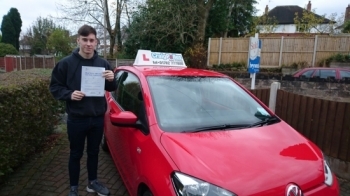 A big congratulations to Mathew Blandford, who has passed his driving test today at Cobridge Driving Test Centre. 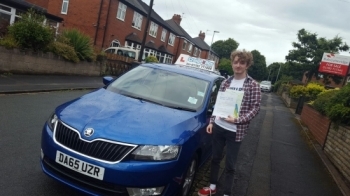 A big congratulations to Will Mercer, who has passed his driving test today at Newcastle Driving Test Centre. 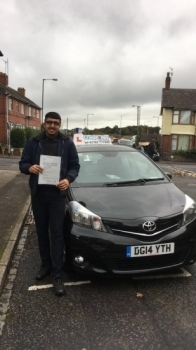 A big congratulations to Ajmal Hussain, who has passed his driving test today, at Cobridge Driving Test Centre, with just 2 driver faults. 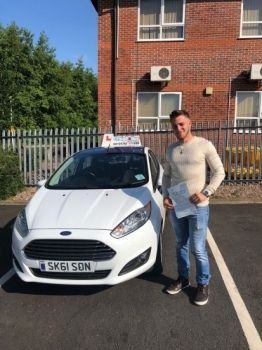 A big congratulations to Nick Meyrick, who has passed his driving test today, at Cobridge Driving Test Centre, with just 5 driver faults. 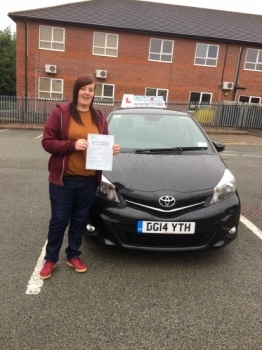 A big congratulations to Miranda Ward, who has passed her driving test today at Newcastle Driving Test Centre, with just 5 driver faults. 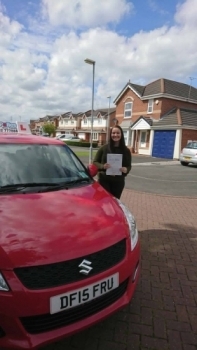 A big congratulations to Molly Robertson, who has passed her driving test at Newcastle Driving Test Centre. 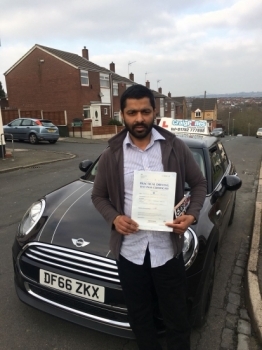 A big congratulations to Harish Nair, who has passed his driving test today at Newcastle Driving Test Centre with just 4 driver faults. 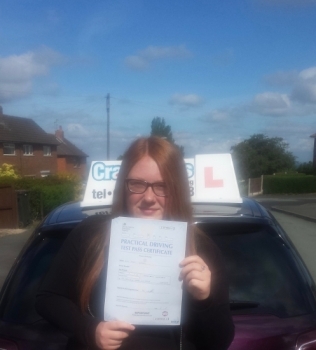 A big congratulations to Alisha Parker, who has passed her driving test today at Crewe Driving Test Centre. 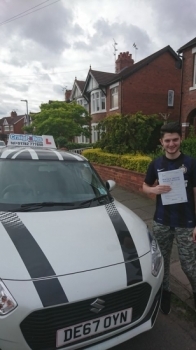 A big congratulations to Luca Hibble, who has passed his driving test today at Newcastle Driving Test Centre. 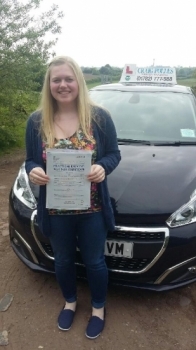 A big congratulations to Beth Mountford, who has passed her driving test today at Newcastle Driving Test Centre. 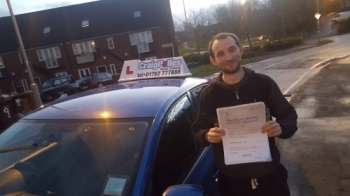 A big congratulations to Ricardo, who has passed his driving test at Crewe Driving Test Centre with 6 driver faults. 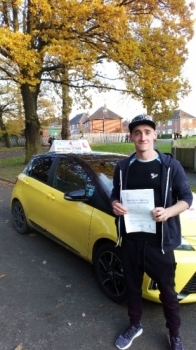 A big congratulations to Jordan Porter, who has passed his driving test today, at Cobridge Driving Test Centre, with just 2 driver faults. 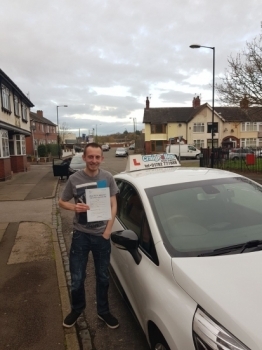 A big congratulations to Ashley Taylor, who has passed his driving test today at Cobridge Driving Test Centre. 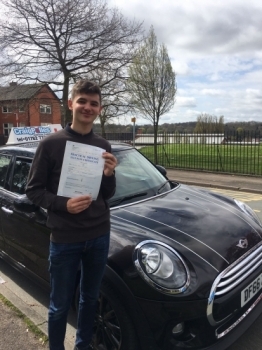 A big congratulations to Ben Hankey, who has passed his driving test today, at Newcastle Driving Test Centre, with just 3 driver faults. 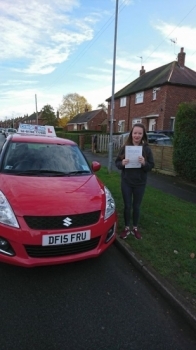 A big congratulations to Sophie Tomkinson, who has passed her driving test today at Crewe Driving Test Centre. 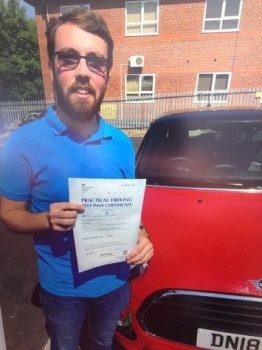 A big congratulations to John Parrish, who has passed his driving test today, at Newcastle Driving Test Centre. 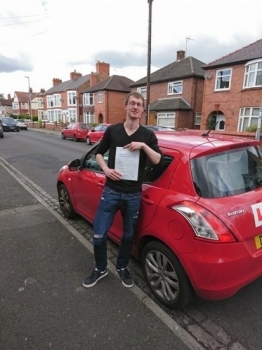 A big congratulations to Jake Brazier, who has passed his driving test today, at Newcastle Driving Test Centre. 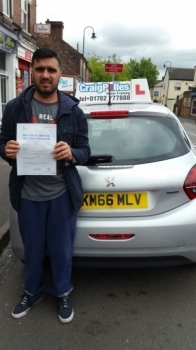 A big congratulations to Arsalan, who has passed his driving test today, at Cobridge Driving Test Centre. 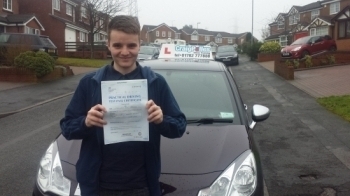 A big congratulations to James McDermott, who has passed his driving test today, at Newcastle Driving Test Centre. 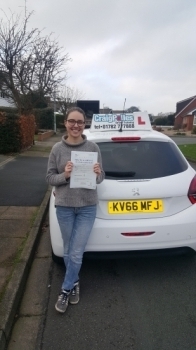 A big congratulations to Cath Chem, who has passed her driving test today, at Cobridge Driving Test Centre. 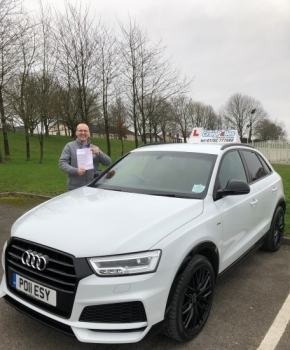 A massive congratulations goes to Paul Lees, who not only passed his ADI Parts 1 and 2 first time, but now, also his ADI Part 3 - Newcastle Driving Test Centre. 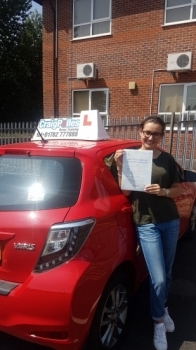 A big congratulations to Cosmina Schiteanu, who has passed her driving test today at Newcastle Driving Test Centre, with 6 driver faults. 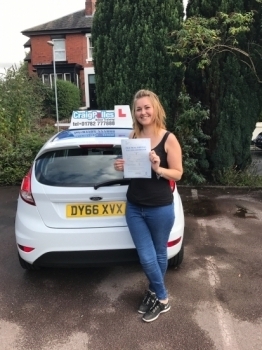 A big congratulations to Georgia Swift, who has passed her driving test today, at Cobridge Driving Test Centre. 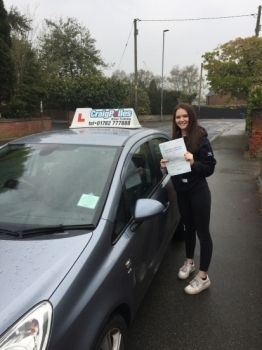 A big congratulations to Lucy Blakeman, who has passed her driving test today, at Cobridge Driving Test Centre with just 1 driver fault. 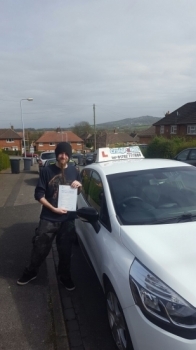 A big congratulations to Shane Beech, who has passed his driving test today, at Cobridge Driving Test Centre. 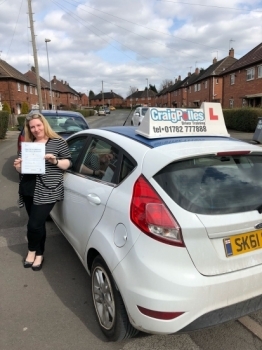 A big congratulations Trina Cook, who has passed her driving test at Cobridge Driving Test Centre. 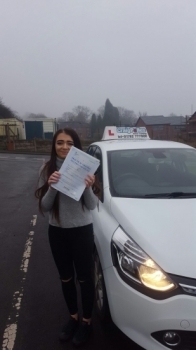 A big congratulations to Olivia Haydon, who her passed her driving test today at Newcastle Driving Test Centre. 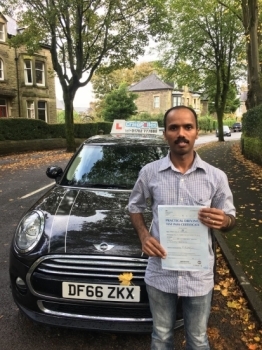 A big congratulations to Johns Abraham, who has passed his driving test today at Newcastle Driving Test Centre, with just 3 driver faults. 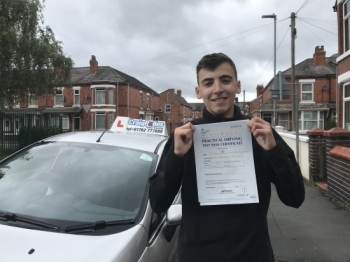 A massive congratulations to Liam Forster, who has passed his driving test today at Newcastle Driving Test Centre, with 0 driver faults. 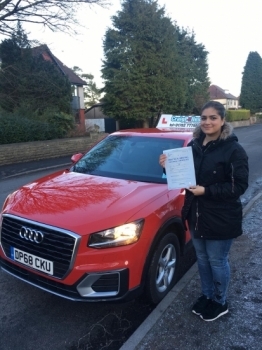 A big congratulations to Dr Cleofina Furtado, who has passed her driving test at Buxton Driving Test Centre. 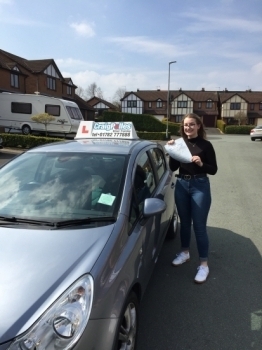 A big congratulations to Sophie Thomson, who has passed her driving test today at Crewe Driving Test Centre, with just 4 driver faults. 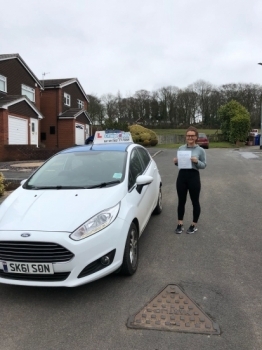 A big congratulations to Megan Brown, who has passed her driving test at Newcastle Driving Test Centre, with just 3 driver faults. 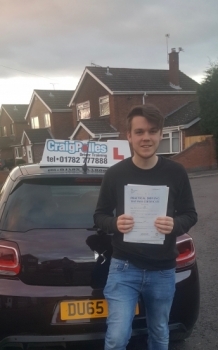 A big congratulations to Jared Townsend, who has passed his driving test today at Crewe Driving Test Centre. 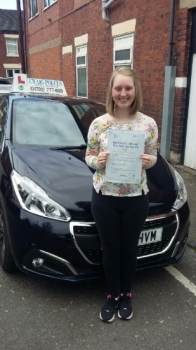 A big congratulations to Emily Prince, who has passed her driving test today at Cobridge Driving Test Centre. First attempt and with 4 driver faults. 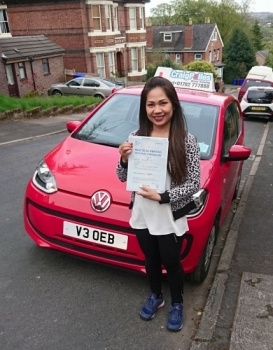 A big congratulations to Moncy Baby, who has passed her driving test today at Buxton Driving Test Centre, with just 4 driver faults. 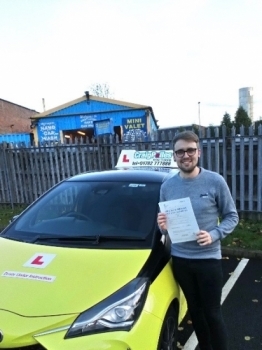 A big congratulations to Ben Brookes, who has passed his driving test today at Newcastle Driving Test Centre. 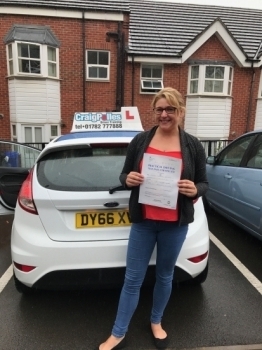 A big congratulations to Claire Moss, who has passed her driving test today at Newcastle Driving Test Centre. 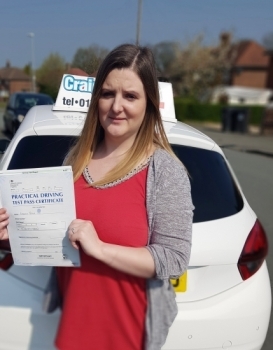 A big congratulations to Nicola Ford, who has passed her driving test today at Crewe Driving Test Centre, with just 2driver faults. 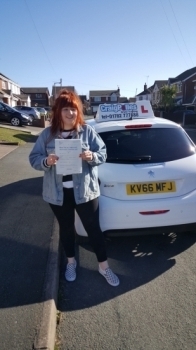 A big congratulations to Chloe Matthews, who has passed her driving test today at Newcastle Driving Test Centre. 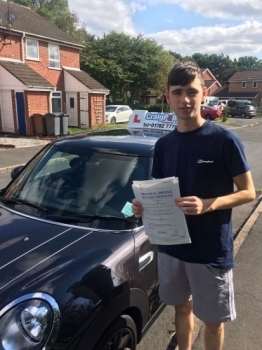 A big congratulations to Cameron, who has passed his driving test toady at Crewe Driving Test Centre, with just 4 driver faults. 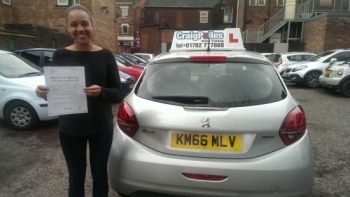 A big congratulations to Bergan Kolukisa, who has passed her driving test today at Newcastle Driving Test Centre. 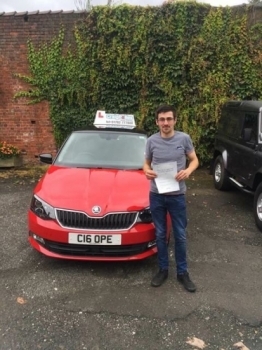 A big congratulations to Alex Webb, who has passed his driving test today at Newcastle Driving Test Centre, with just 4 driver faults. 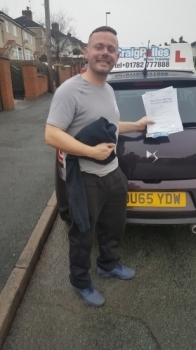 A big congratulations to Peter Archer, who has passed his driving test toady at Crewe Driving Test Centre. 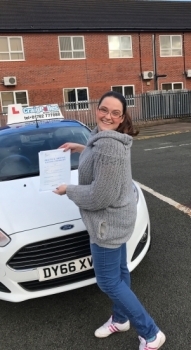 A big congratulations to Stacey, who has passed her driving test today at Cobridge Driving Test Centre, with just 3 driver faults. 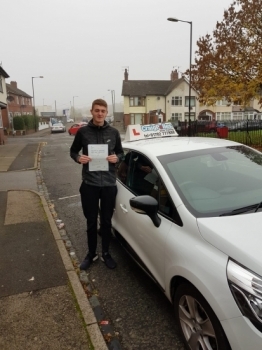 A big congratulations to James Groves, who has passed his driving test today at Newcastle Driving Test Centre, with 7 driver faults. with just 4 driver faults. 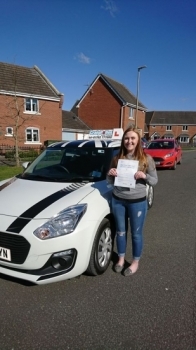 A big congratulations to Megan Wynn, who has passed her driving test today at Newcastle Driving Test Centre. 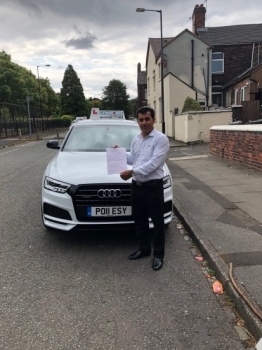 A big congratulations to Sirwan, who has passed his ADI Part 3 Test. All the best with your new career. 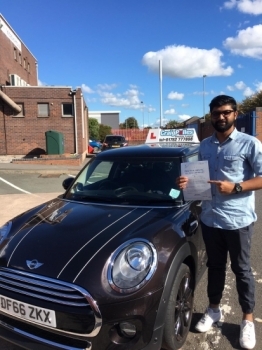 A big congratulations to Mujahid Chaudry, who has passed his driving test today at Newcastle Driving Test Centre. First attempt and with 8 driver faults. 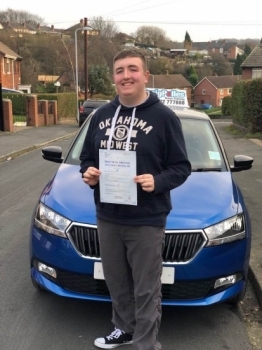 A big congratulations to Benjamin Joseph Bevington, who has passed his driving test today at Newcastle Driving Test Centre. 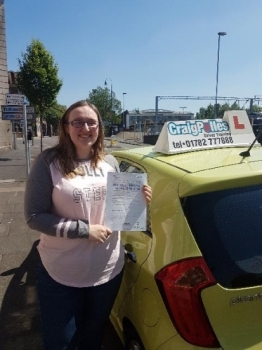 A big congratulations to Monica Graham, who has passed her driving test today at Cobridge Driving Test Centre, with just 2 driver faults. 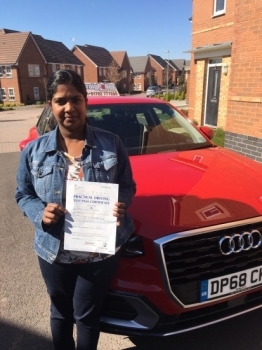 A big congratulations to Jaqui Natty, who has passed her driving test today at Cobridge Driving Test Centre, with just 6 driver faults. 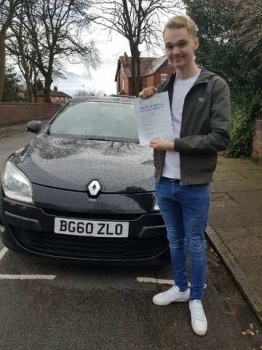 A massive congratulations to Alex Hemming, who has passed his driving test today at Cobridge Driving Test Centre, at his First attempt and with 0 driver faults. 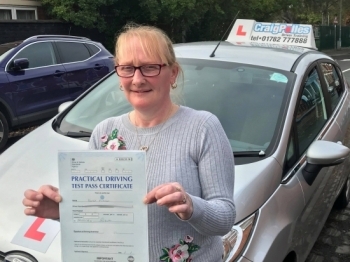 A big congratulations to Janis Hanif, who has passed her driving test today at Cobridge Driving Test Centre, with just 4 driver faults. 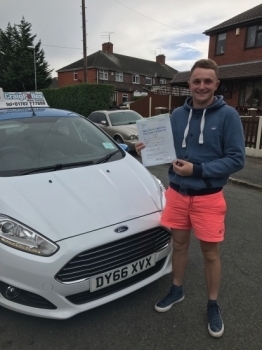 A big congratulations to Nathan Guildford, who has passed his driving test today at Crewe Driving Test Centre. 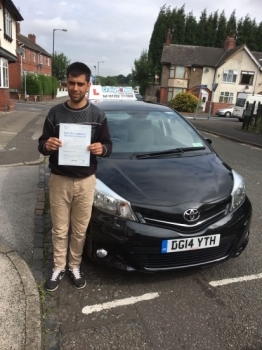 A big congratulations to Umar Abrar Hussain, who has passed his driving test today at Cobridge Driving Test Centre. with just 2 driver faults. 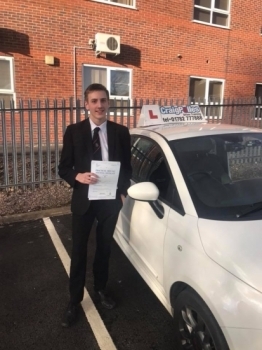 A big congratulations to Isaac Vickers, who has passed his driving test toady at Cobridge Driving Test Centre. 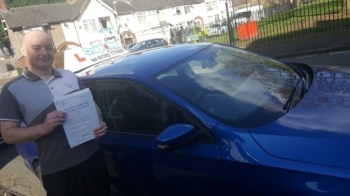 A big congratulations to Robert Franklin, who has passed his driving test toady at Cobridge Driving Test Centre. First attempt and with just 7 driver faults. 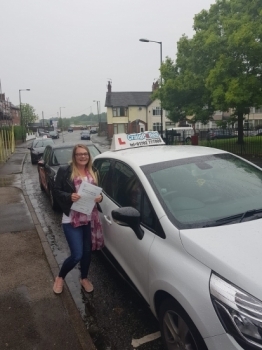 A big congratulations to Amy Morris, who has passed his driving test today at Crewe Driving Test Centre with 9 driver faults. 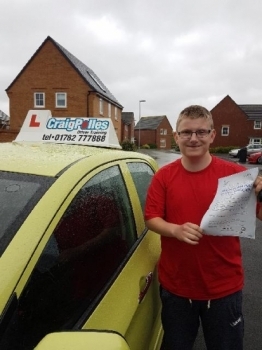 A big congratulations to Josh Griffiths, who has passed his driving test toady at Cobridge Driving Test Centre. 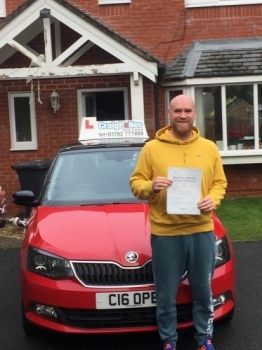 A big congratulations to Mick Owen, who has passed his driving test toady at Newcastle Driving Test Centre. 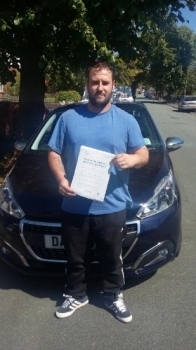 A big congratulations to Dave Whitehurst, who has passed his driving test at Newcastle Driving Test Centre. 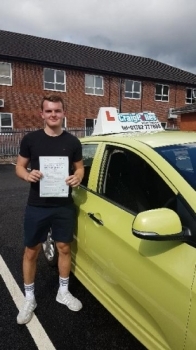 A big congratulations to Lewis Carter, who has passed his driving test at Cobridge Driving Test Centre. 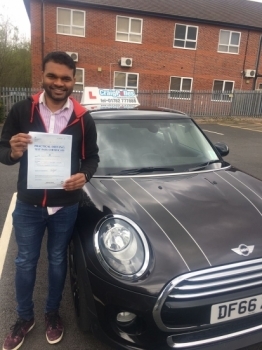 A big congratulations to Abhiraj Radhakrishnan, who has passed his driving test today at Newcastle Driving Test Centre with just 7 driver faults. 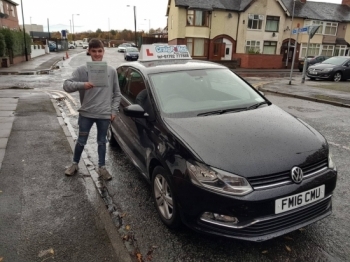 A big congratulations to Harvey Wood, who has passed his driving test at Newcastle Driving Test Centre with just 6 driver faults. 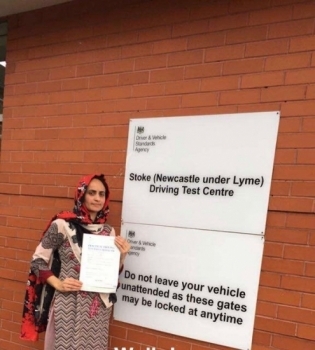 A big congratulations to Dr Asma Mughal, who has passed her driving test today at Newcastle Driving Test Centre. 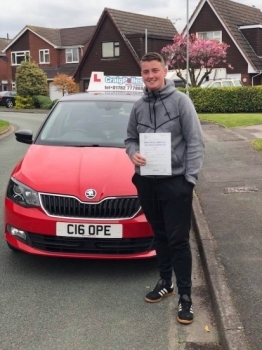 A big congratulations to Billy McConnell, who has passed his driving test at Crewe Driving Test Centre. 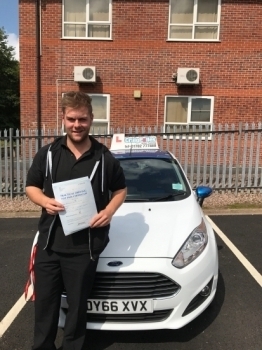 A big congratulations to Matthew Teague, who has passed his driving test at Newcastle Driving Test Centre with just 5 driver faults. 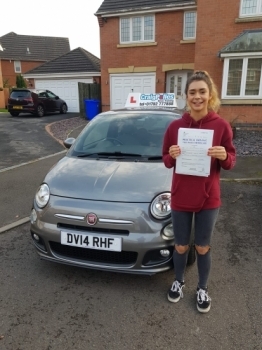 A big congratulations to Chloe Ball, who has passed her driving test at Newcastle Driving Test Centre with 4 driver faults. 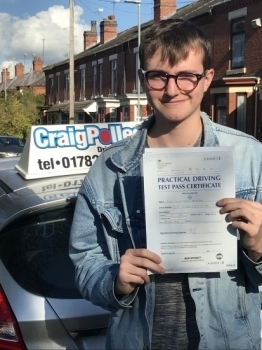 A big congratulations to Tom Powell, who has passed his driving test at Cobridge Driving Test Centre. 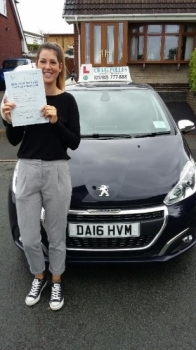 A big congratulations to Tessa Cournoyer, who has passed her driving test today at Newcastle Driving Test Centre. 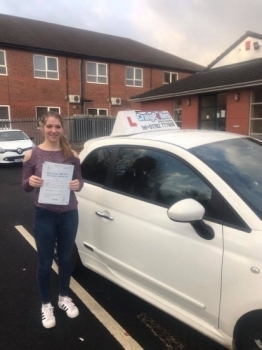 A big congratulations to Georgia Cartridge, who has passed her driving test at Newcastle Driving Test Centre with 0 driver faults. 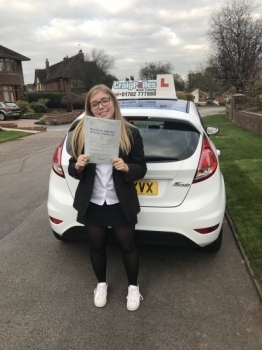 A big congratulations to Maisy Chidlow, who has passed her driving test at Newcastle Driving Test Centre with just 6 driver faults. 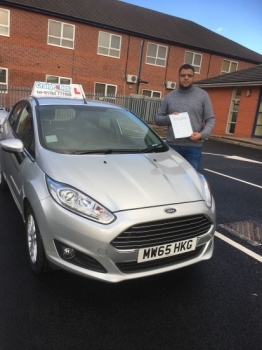 A big congratulations to Hassan Hany, who has passed his driving test at Newcastle Driving Test Centre with 0 driver faults. 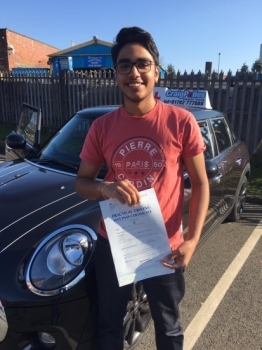 A big congratulations to Alen Alex, who has passed his driving test today at Newcastle Driving Test Centre. 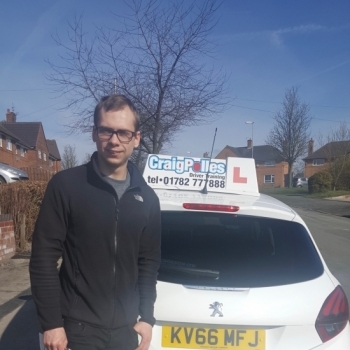 A big congratulations to Josef Zajac, who has passed his driving test at Crewe Driving Test Centre with just 2 driver faults. 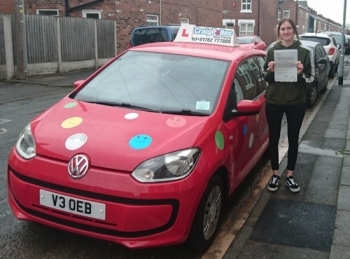 A big congratulations to Emily Hagan, who has passed her driving test today at Newcastle Driving Test Centre. 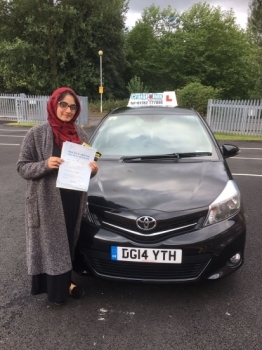 A big congratulations to Miss Safia Haleema Mahmood, who has passed her driving test today at Newcastle Driving Test Centre. First attempt and with 0 driver faults. 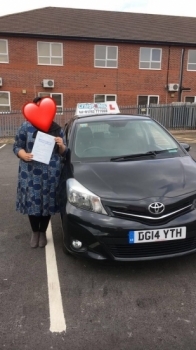 A big congratulations to the lady with the heart shaped face, who has passed her driving test today at Newcastle Driving Test Centre, at her First attempt. 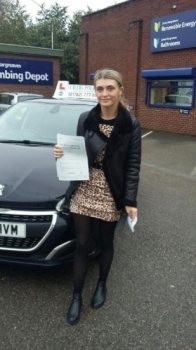 A big congratulations to Chloe Powell, who has passed her driving test today at Newcastle Driving Test Centre. 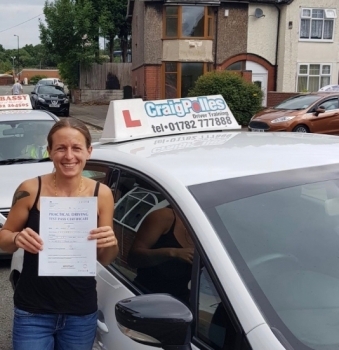 A big congratulations to Gina, who has passed her driving test at Cobridge Driving Test Centre with just 5 driver faults. 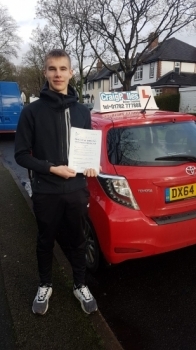 A big congratulations to Declan Pugh, who has passed his driving test at Cobridge Driving Test Centre, at his First attempt and with just 4 driver faults. 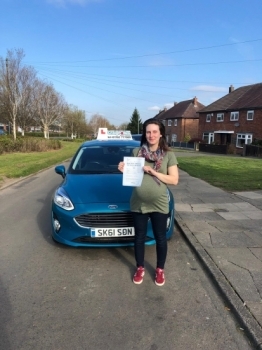 A big congratulations to Nicole Key, who has passed her driving test today at Cobridge Driving Test Centre with just 5 driver faults. 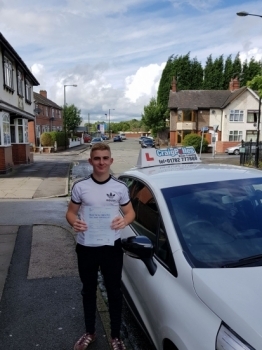 A big congratulations to Adam Croether, who has passed his driving test at Crewe Driving Test Centre, at his First attempt and with just 4 driver faults. 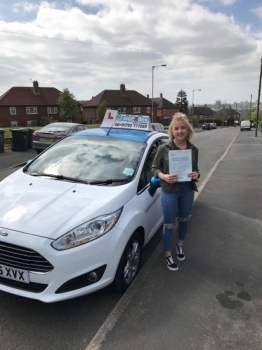 A big congratulations to Amy Dawson, who has passed her driving test today at Newcastle Driving Test Centre, with 4 driver faults. 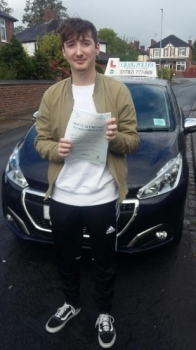 A big congratulations to Sam Heatley, who has passed his driving test today at Newcastle Driving Test Centre. 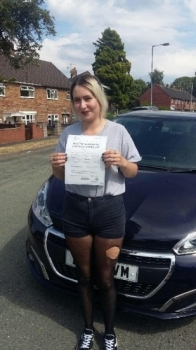 A big congratulations to Kia Hudson, who has passed her driving test today at Cobridge Driving Test Centre. 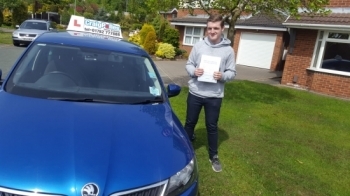 A big congratulations to Jack Keeling, who has passed his driving test today at Cobridge Driving Test Centre. 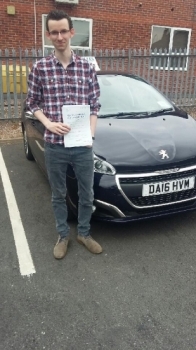 A big congratulations to James Pleavin, who has passed his driving test today at Cobridge Driving Test Centre. 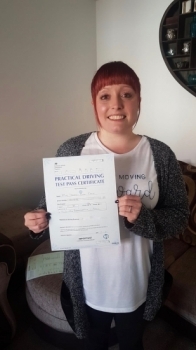 A big congratulations to Kerry Spicer, who has passed her driving test at Newcastle Driving Test Centre. 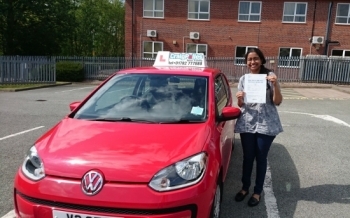 A big congratulations to Shani Abraham, who has passed her driving test today at Buxton Driving Test Centre. 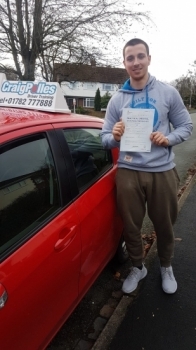 A big congratulations to Karl Oates, who has passed his driving test at Cobridge Driving Test Centre. 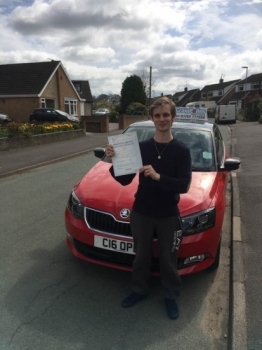 A big congratulations to James Read, who has passed his driving test today at Cobridge Driving Test Centre, with 3 driver faults. 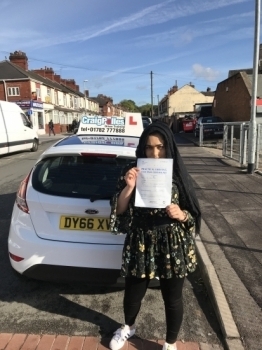 A big congratulations to Tazrabin Jawadin, who has passed her driving test today at Newcastle Driving Test Centre, with 7 driver faults. 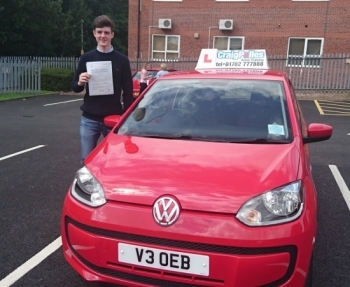 A big congratulations to Connor Henry-Blake, who has passed his driving test today at Newcastle Driving Test Centre. 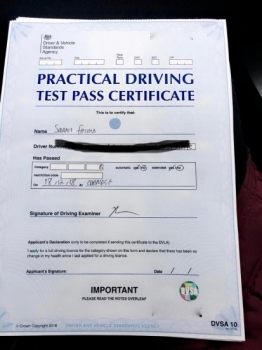 - - Just passed my test today, can’t thank SJ Breeze enough for helping me pass. Professional, friendly and patient. 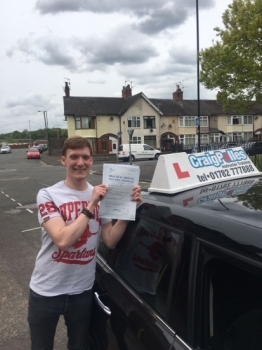 A big congratulations to Michael Gillick, who has passed his driving test today at Crewe Driving Test Centre, with 9 driver faults. 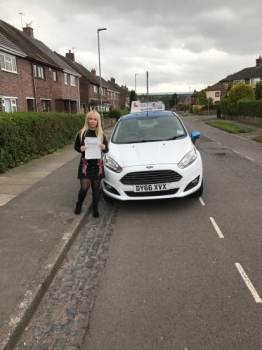 A big congratulations to Nammie Jones, who has passed her driving test at Newcastle Driving Test Centre, with 8 driver faults. 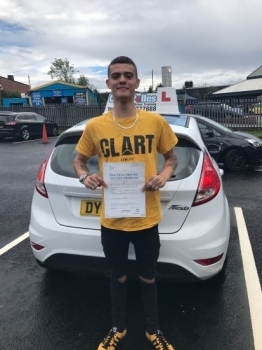 A big congratulations to Antonio Marco Aldada, who has passed his driving test today at Newcastle Driving Test Centre. 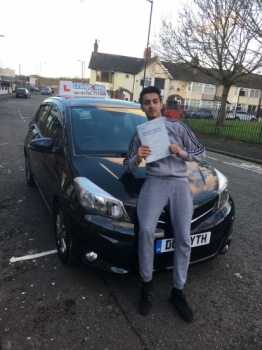 A big congratulations to Shohaib Ahmed, who has passed his driving test today at Cobridge Driving Test Centre, with 7 driver faults. 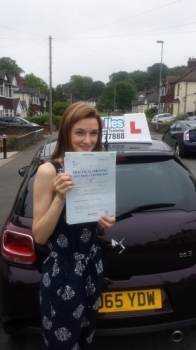 A big congratulations to Evie Earls-Davis, who has passed her driving test today at Newcastle Driving Test Centre. 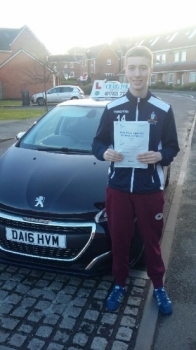 A big congratulations to Connah Mclean , who has passed his driving test today at Cobridge Driving Test Centre. 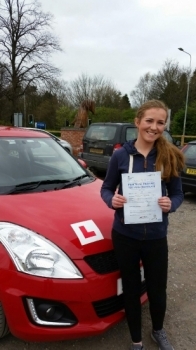 A big congratulations to Emily Edwards, who has passed her driving test today at Newcastle Driving Test Centre. 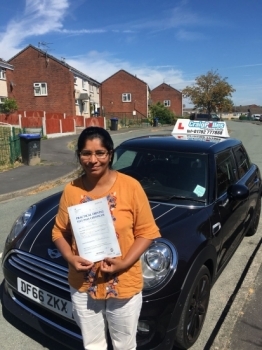 A big congratulations to Janeeta Rose Thomas, who has passed her driving test today at Newcastle Driving Test Centre, with just 3 driver faults. 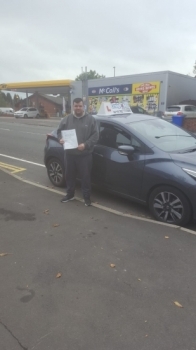 A big congratulations to Jim Moston, who has passed his driving test today at Cobridge Driving Test Centre, with just 1 driver fault. 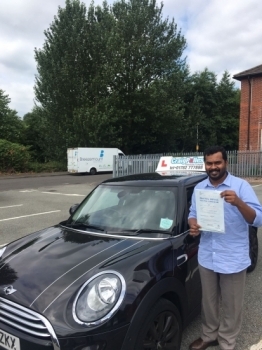 A big congratulations to Sooraj Gopalan, who has passed his driving test today at Newcastle Driving Test Centre, with 7 driver faults. 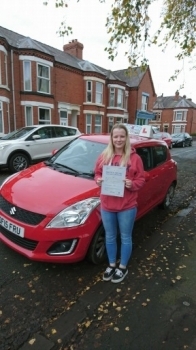 A big congratulations to Chloe Preston, who has passed her driving test today at Newcastle Driving Test Centre. 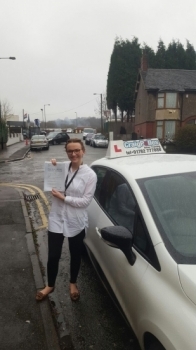 A big congratulations to Courtney Evans, who has passed her driving test today at Newcastle Driving Test Centre. 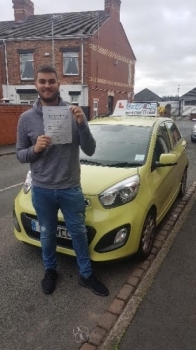 A big congratulations to Jordan Day, who has passed his driving test today at Cobridge Driving Test Centre, with just 2 driver faults. 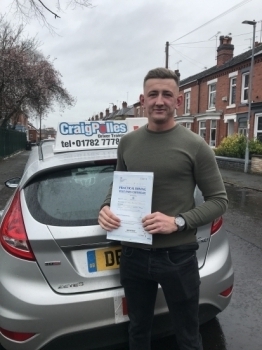 A big congratulations to Sean Houlston, who has passed his driving test today at Crewe Driving Test Centre, with just 3 driver faults. 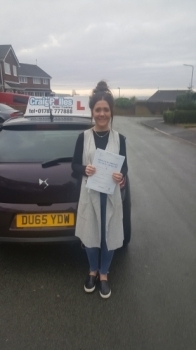 A big congratulations to Carly Bennett, who has passed her driving test today at Cobridge Driving Test Centre. Congratulations today, go to Paul Lees. 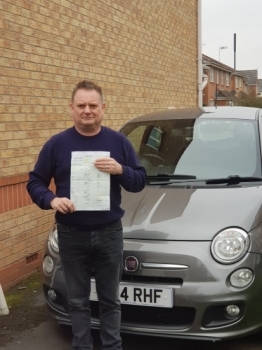 Paul has passed his ADI Part 2 test at Newcastle driving test centre at the first attempt and with a fantastic ´0´ driver faults. 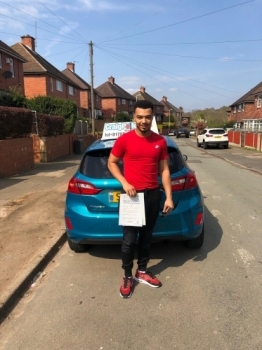 A big congratulations to Marcus Dockery, who has passed his driving test at Crewe Driving Test Centre, at his First attempt and with 3 driver faults. 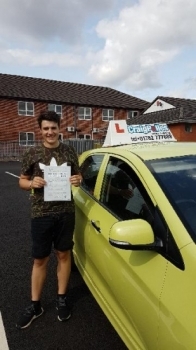 A big congratulations to Jordan Craddock, who has passed his driving test today at Cobridge Driving Test Centre, at his First attempt and with 3 driver faults. 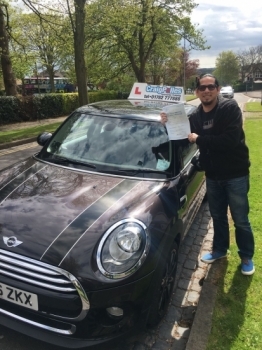 A big congratulations to Pablo, who has passed his driving test at Crewe Driving Test Centre, with just 3 driver faults. 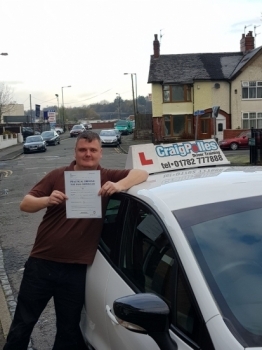 A big congratulations to Terry Kane, who has passed his driving test today at Newcastle Driving Test Centre, at his First attempt and with 7 driver faults. 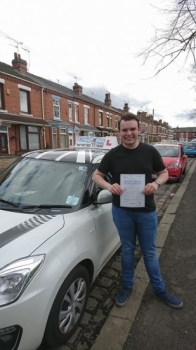 A big congratulations to Aidan Morley, who has passed his driving test at Newcastle Driving Test Centre, at his First attempt and with just 3 driver faults. 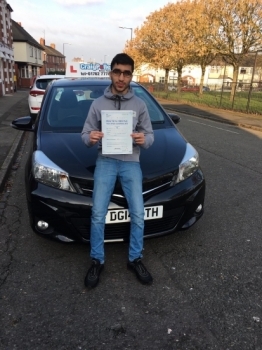 A big congratulations to Mohammed Kashif, who has passed his driving test at Cobridge Driving Test Centre, with just 2 driver faults. 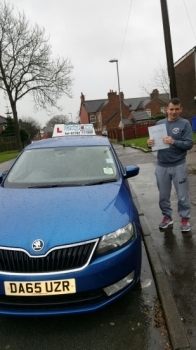 - - Really happy passed 1st time, would like to thank Debbie Griffin for getting me through it. 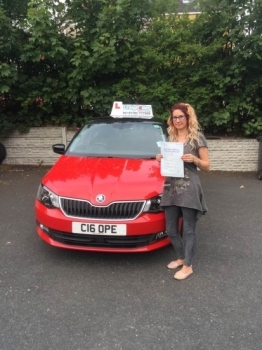 Would 100% recommend Debbie to any one, good if you are nervous as she helps you to overcome them nerves and get you that pass that you need. 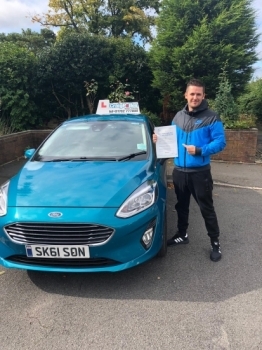 A big congratulations to Shane Dixon, who has passed his driving test at Newcastle Driving Test Centre, at his First attempt and with just 6 driver faults. 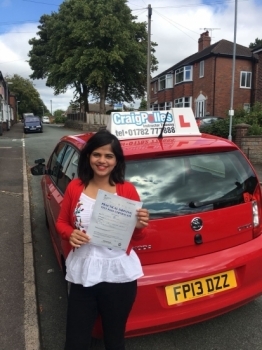 A big congratulations to Deepa Devassy, who has passed her driving test today at Buxton Driving Test Centre, with just 2 driver faults. 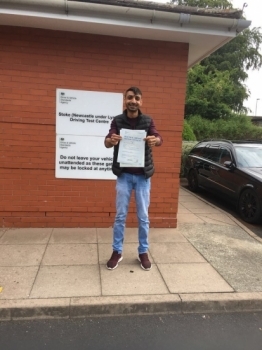 A big congratulations to Usnain Sajid, who has passed his driving test today at Newcastle Driving Test Centre, with just 4 driver faults. 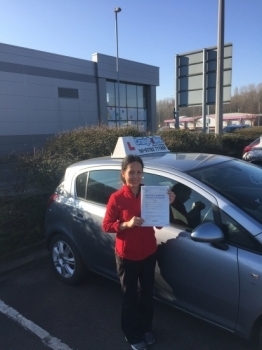 A big congratulations to Leigh Arellano, who has passed her driving test today at Newcastle Driving Test Centre, with just 5 driver faults. 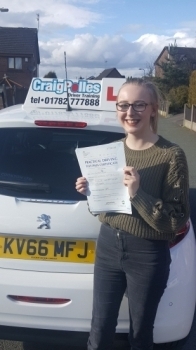 A big congratulations to Paige Frost, who has passed her driving test today at Cobridge Driving Test Centre, with just 5 driver faults. 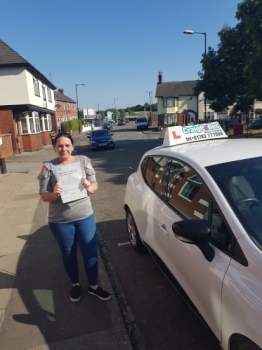 A big congratulations to Michelle Hampton, who has passed her driving test at Newcastle Driving Test Centre, at her First attempt and with just 4 driver faults. 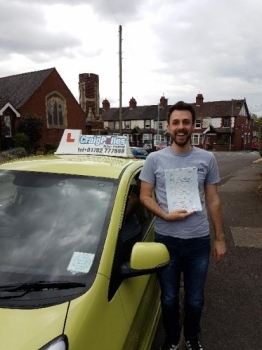 A big congratulations to Todd Thompstone, who has passed his driving test at Cobridge Driving Test Centre, at his First attempt and with just 4 driver faults. 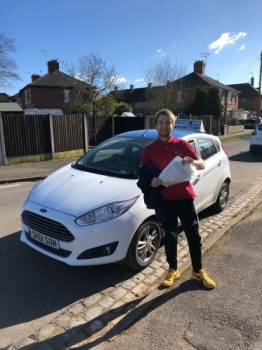 big thank you to Dave in helping me achieve a first time pass! 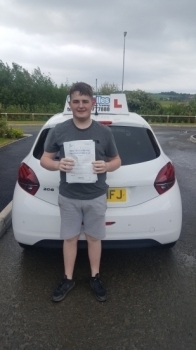 A big congratulations to Jacob Mcavoy, who has passed his driving test at Cobridge Driving Test Centre, at his First attempt and with just 4 driver faults. 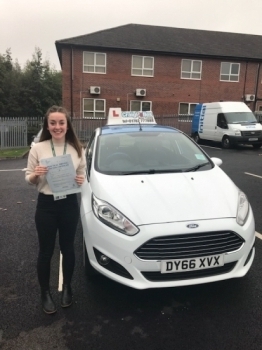 A big congratulations to Lauren Bebbington, who has passed her driving test today at Newcastle Driving Test Centre, with just 3 driver faults. 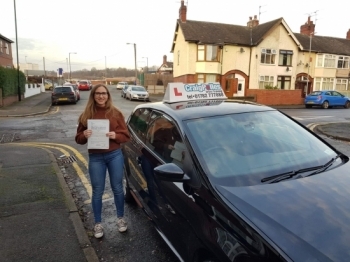 A big congratulations to Isabella Denny, who has passed her driving test today at Crewe Driving Test Centre, with just 2 driver faults. 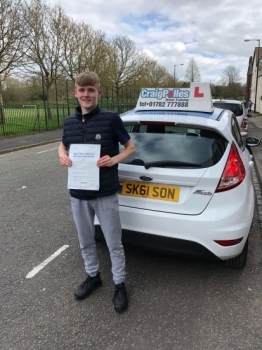 A big congratulations to Reece Palmer, who has passed his driving test today at Newcastle Driving Test Centre, at his First attempt and with just 4 driver faults. 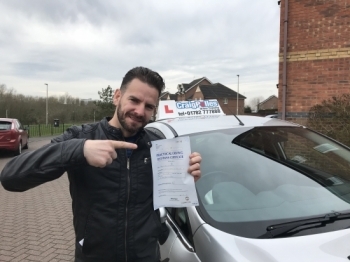 Dave was a great instructor, calm and relaxed, able to be flexible to suite when I could have lessons and gave quality tuition, I would highly recommend him! 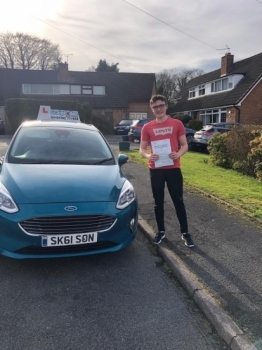 A big congratulations to Jack Whitley, who has passed his driving test at Newcastle Driving Test Centre, at his First attempt and with just 3 driver faults. 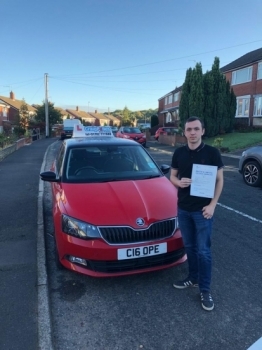 A big congratulations to Andrew Burgess, who has passed his driving test at Cobridge Driving Test Centre, at his First attempt and with just 3 driver faults. 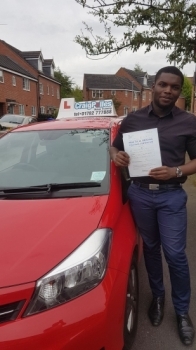 A big congratulations to Nahman Ulhauque, who has passed his driving test at Cobridge Driving Test Centre, with 6 driver faults. 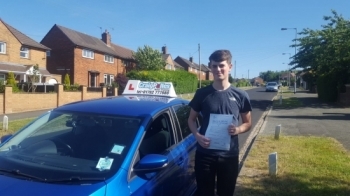 A massive congratulations to Liam Mountford, who has passed his driving test today at Cobridge Driving Test Centre, at his First attempt and with 0 driver faults. 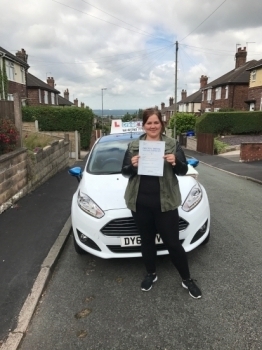 A big congratulations to Melissa Thomas, who has passed her driving test today at Newcastle Driving Test Centre, with 7 driver faults. 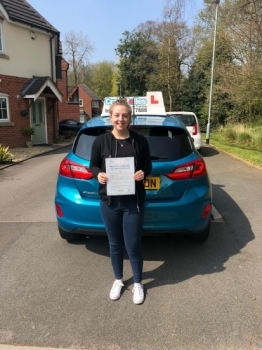 A big congratulations to Emily Moore, who has passed her driving test at Cobridge Driving Test Centre, with just 5 driver faults. 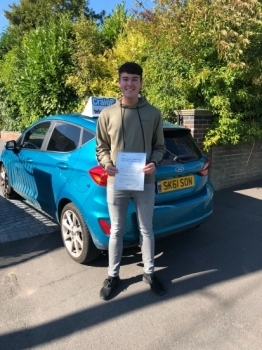 A big congratulations to Matthew Wilshaw, who has passed his driving test today at Newcastle Driving Test Centre, at his First attempt and with just 5 driver faults. 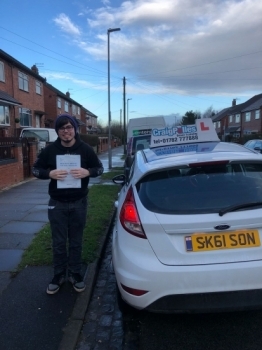 A big congratulations to Joe Speakman, who has passed his driving test today in blizzard conditions at Crewe Driving Test Centre, at his First attempt and with just 3 driver faults. 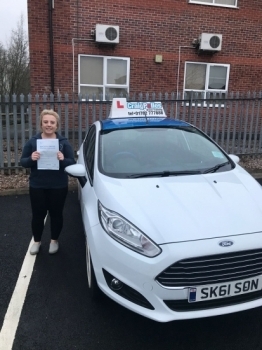 A big congratulations to Samantha Shaw, who has passed her driving test today at Newcastle Driving Test Centre, with just 4 driver faults. 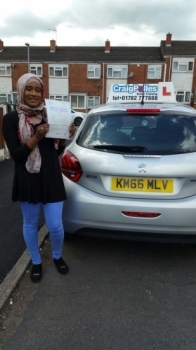 A big congratulations to Zeta Bagguley, who has passed her driving test today at Crewe Driving Test Centre, at her First attempt and with 8 driver faults. 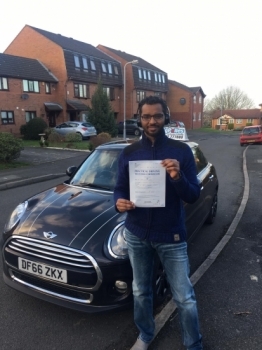 A big congratulations to Thomas Philip, who has passed his driving test today at Cobridge Driving Test Centre, with just 5 driver faults. 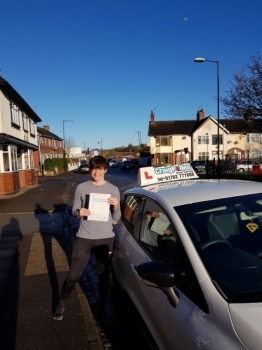 A big congratulations to Daniel Ratcliffe, who has passed his driving test today at Newcastle Driving Test Centre, at his First attempt and with just 1 driver fault. 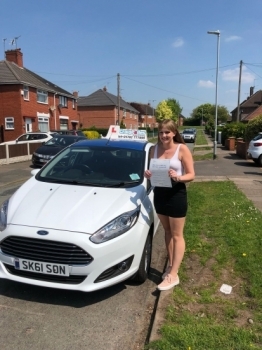 A big congratulations to Jemma Hanson, who has passed her driving test today at Cobridge Driving Test Centre, at her First attempt and with just 3 driver faults. 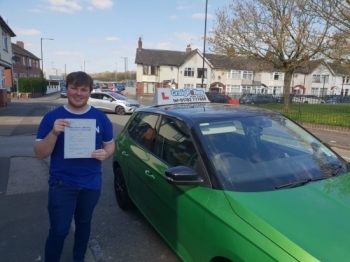 A big congratulations to Daniel Whitehouse, who has passed his driving test today at Cobridge Driving Test Centre, at his First attempt and with just 1 driver fault. 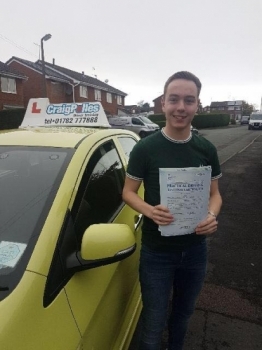 A big congratulations to Cameron Gallimore, who has passed his driving test today at Crewe Driving Test Centre, with just 4 driver faults. 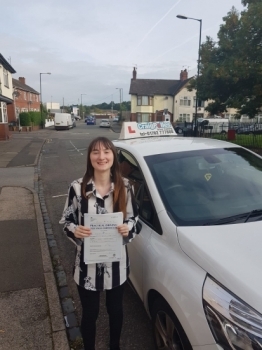 A big congratulations to Libby Dean, who has passed her driving test today at Newcastle Driving Test Centre, at her First attempt and with just 4 driver faults. 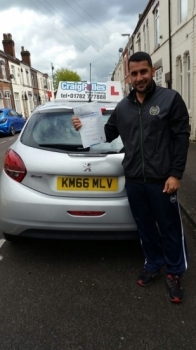 A big congratulations to Alsadig Sabone, who has passed his driving test today at Cobridge Driving Test Centre. 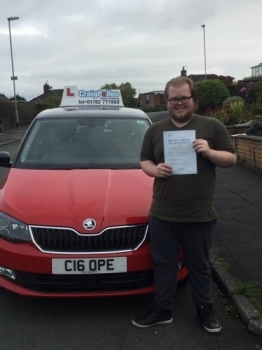 A big congratulations to Matt Johnson, who has passed his driving test today at Newcastle Driving Test Centre, at his First attempt and with just 2 driver faults. 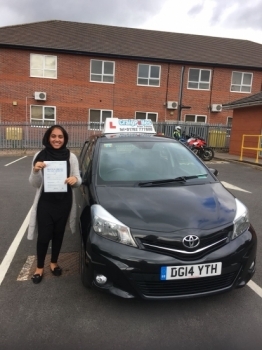 A big congratulations to Kainat Basheer, who has passed her driving test today at Newcastle Driving Test Centre, at her First attempt and with just 1 driver fault. 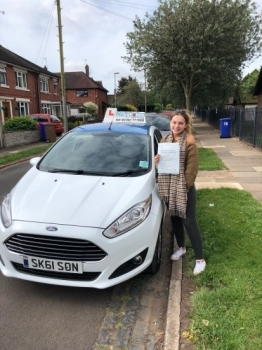 A big congratulations to Georgia Cadman, who has passed her driving test today at Cobridge Driving Test Centre, with just 1 driver fault. 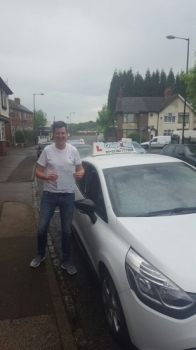 A big congratulations to Dom Casey, who has passed his driving test today at Cobridge Driving Test Centre, with 6 driver faults. 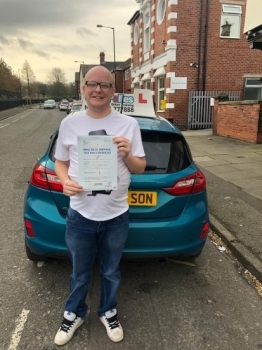 A big congratulations to Brandon Smith, who has passed his driving test today at Newcastle Driving Test Centre, with 6 driver faults. 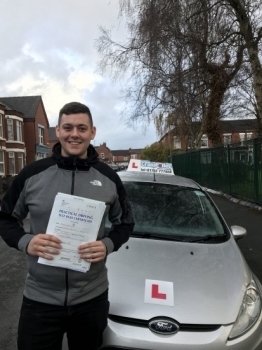 A big congratulations to Liam Cope, who has passed his driving test at Newcastle Driving Test Centre, with 7 driver faults. 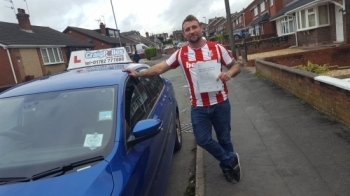 A big congratulations to Richard Sumner, who has passed his driving test today at Crewe Driving Test Centre, with just 4 driver faults. 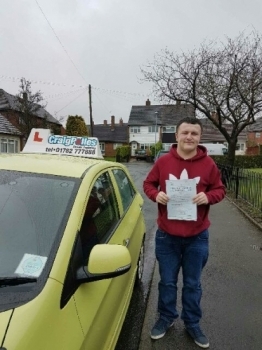 A big congratulations to Liam White, who has passed his driving test today at Cobridge Driving Test Centre, at his First attempt and with just 2 driver faults. 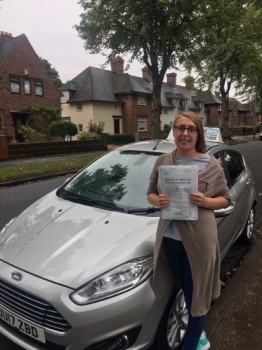 A big congratulations to Emma Ray, who has passed her driving test at Cobridge Driving Test Centre, with just 5 driver faults. 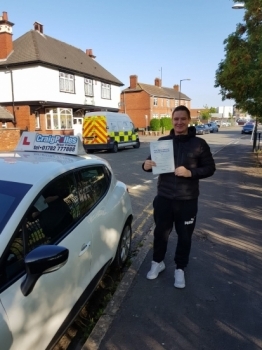 A big congratulations to Jordon Hackney, who has passed his driving test today at Cobridge Driving Test Centre, at his First attempt and with just 6 driver faults. 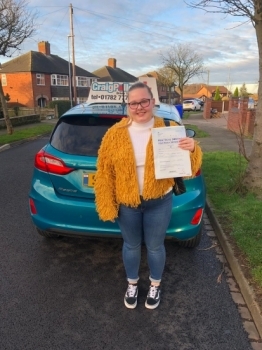 A big congratulations to Lauren Scott, who has passed her driving test today at Newcastle Driving Test Centre, at her First attempt and with just 2 driver faults. 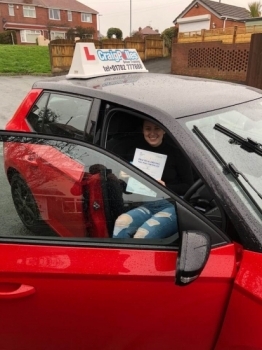 A big congratulations to Emily Mclatchie, who has passed her driving test at Cobridge Driving Test Centre, at her First attempt and with just 4 driver faults. 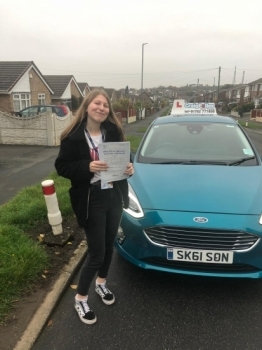 A big congratulations to Megan Wilkinson, who has passed her driving test at Newcastle Driving Test Centre, at her First attempt and with just 5 driver faults. 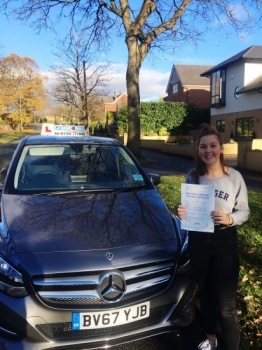 A big congratulations to Lucy Bould, who has passed her driving test today at Newcastle Driving Test Centre, with 7 driver faults. 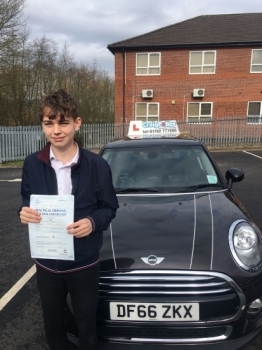 A big congratulations to Kieran Bebbington, who has passed his driving test today at Newcastle Driving Test Centre, with just 1 driver fault. 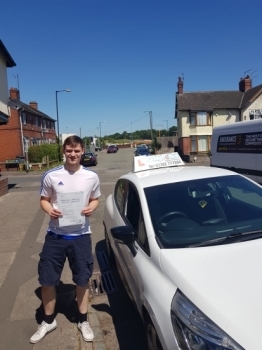 A big congratulations to Tom Baillie, who has passed his driving test today at Cobridge Driving Test Centre, with 6 driver faults. 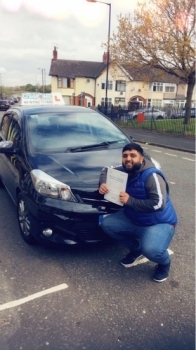 A big congratulations to Asam Iqbal, who has passed his driving test at Cobridge Driving Test Centre, at his First attempt and with just 2 driver faults. 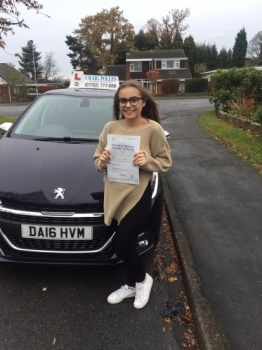 A big congratulations to Demi Plant, who has passed her driving test today at Cobridge Driving Test Centre, with just 6 driver faults. 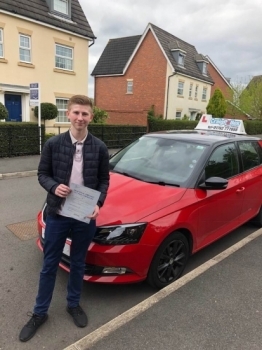 A big congratulations to Ronan Proud, who has passed his driving test today at Cobridge Driving Test Centre, at his First attempt and with just 6 driver faults. 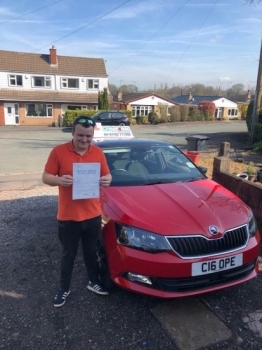 A big congratulations to John Westwood, who has passed his driving test today at Cobridge Driving Test Centre, at his First attempt and with just 5 driver faults. 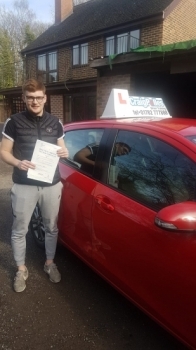 A big congratulations to Tom McCormick, who has passed his driving test today at Cobridge Driving Test Centre, at his First attempt and with just 2 driver faults. 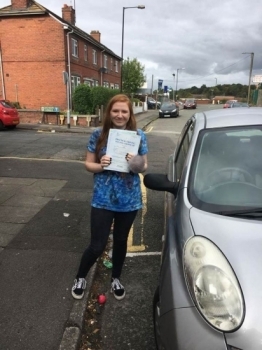 A big congratulations to Hannah Haworth, who passed her driving test today at Cobridge Driving Test Centre, with just 5 driver faults. 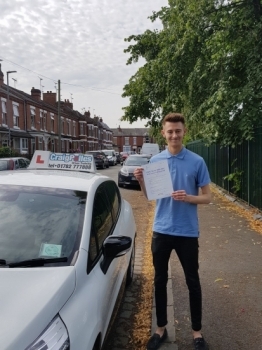 A big congratulations to Alex Pargeter, who has passed his driving test today at Newcastle Driving Test Centre, at his First attempt and with just 5 driver faults. 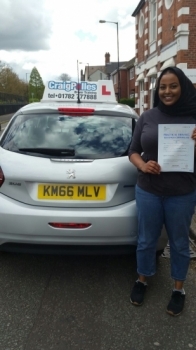 A big congratulations to Afsa Shaban, who passed her driving test today at Cobridge Driving Test Centre, with 7 driver faults. 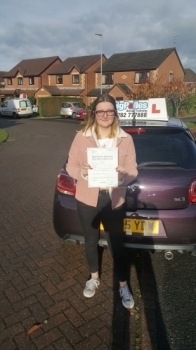 A big congratulations to Rhea Meakin, who passed her driving test today at Cobridge Driving Test Centre, with 7 driver faults. 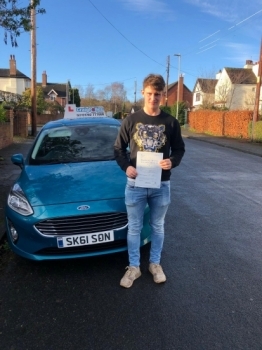 A big congratulations to Max Clark, who has passed his driving test today at Cobridge Driving Test Centre, at his First attempt and with just 7 driver faults. 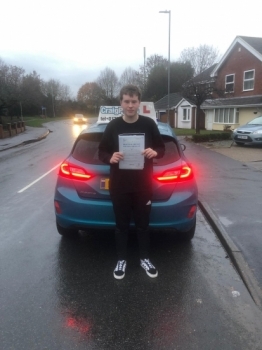 A big congratulations to James Moorehouse, who has passed his driving test today at Cobridge Driving Test Centre, at his First attempt and with just 1 driver fault. 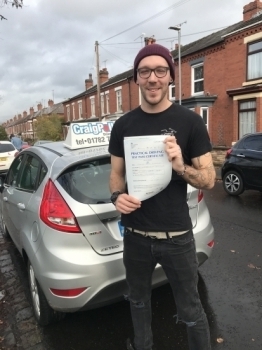 A big congratulations to Carl Myatt, who passed his driving test today at Newcastle Driving Test Centre, with just 2 driver faults. 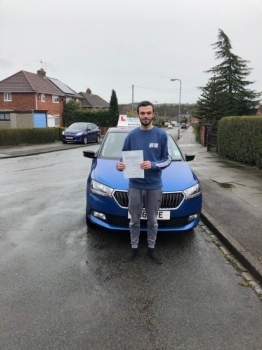 A big congratulations to Josef Billington, who has passed his driving test today at Newcastle Driving Test Centre, at his First attempt and with just 6 driver faults. 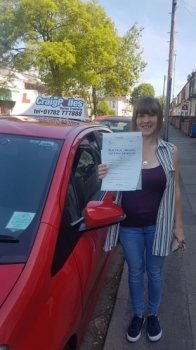 A big congratulations to Lisa Barnett, who passed her driving test today at Cobridge Driving Test Centre, with 6 driver faults. 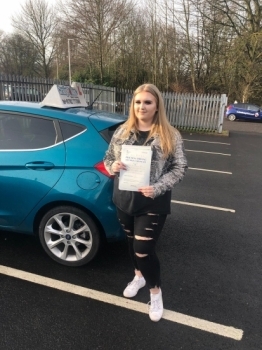 A big congratulations to Ella Phoenix, who has passed her driving test today at Newcastle Driving Test Centre, at her First attempt and with just 3 driver faults. 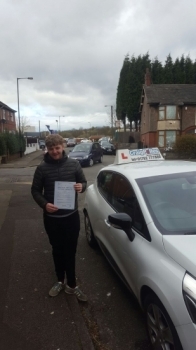 A big congratulations to Connor Riley, who passed his driving test today at Cobridge Driving Test Centre, with just 2 driver faults. 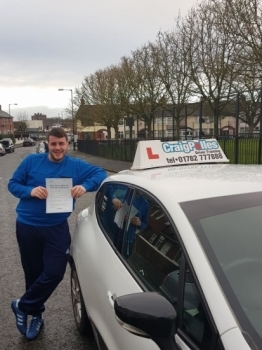 Well done Connor - safe driving from all at Craig Polles Instructor Training and Driving School. 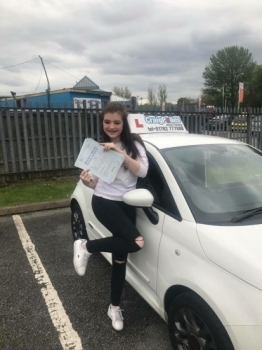 A big congratulations to Ellie Cunningham, who passed her driving test today at Newcastle Driving Test Centre, with just 3 driver faults. 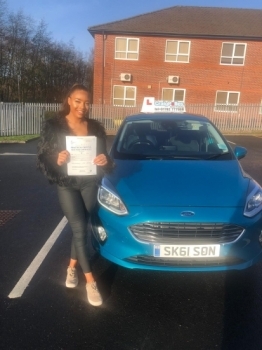 A big congratulations to Tiffany Bereton, who has passed her driving test today at Newcastle Driving Test Centre, at her First attempt. 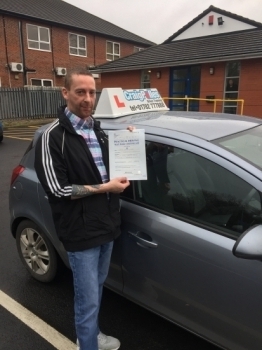 A big congratulations to Mike Stoddard, who has passed his driving test today at Newcastle Driving Test Centre, with just 3 driver faults. 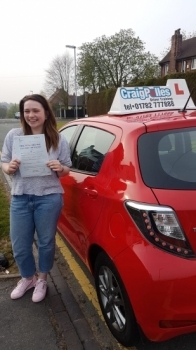 A big congratulations to Charlie Awde, who has passed her driving test today at Newcastle Driving Test Centre. First time and with just 2 driver faults. 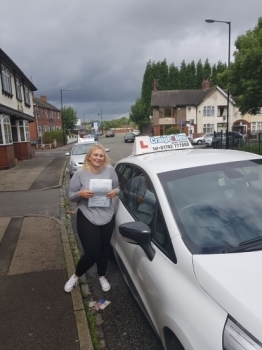 A big congratulations to Tegan Hyett , who has passed her driving test today at Newcastle Driving Test Centre, with 8 driver faults. 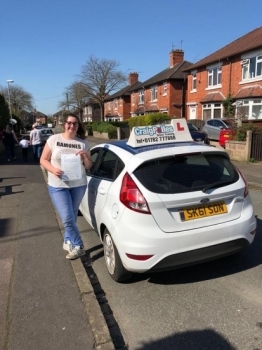 A big congratulations to Rebecca Morris, who has passed her driving test today at Crewe Driving Test Centre. First time and with just 4 driver faults. 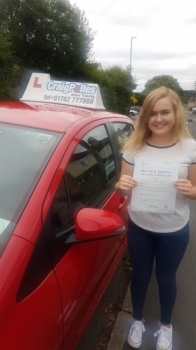 A big congratulations to Laura Jones, who has passed her driving test today at Cobridge Driving Test Centre. First time and with just 1 driver fault. 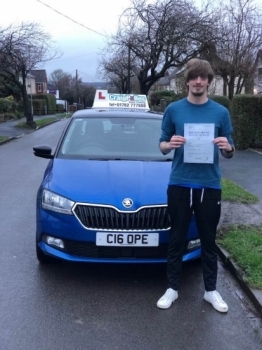 A big congratulations to Daniel Wood, who has passed his driving test today at Cobridge Driving Test Centre, with just 4 driver faults. 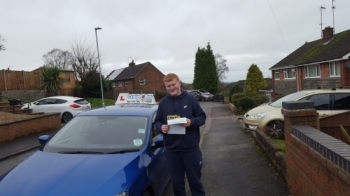 A big congratulations to Ryan Denton, who has passed his driving test today at Cobridge Driving Test Centre. First time and with just 2 driver faults. 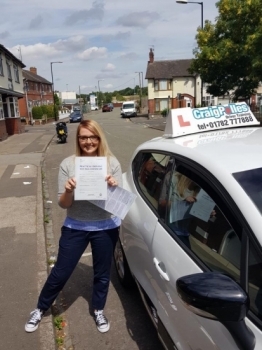 A big congratulations to Kerri-Anne Williams, who passed her driving test today at Crewe Driving Test Centre, first time and with just 4 driver faults. A big congratulations to Malik Osman. 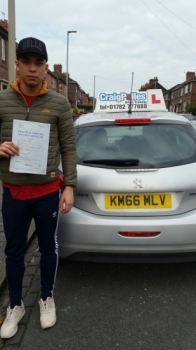 Malik passed his driving test at Newcastle Driving Test Centre, with just 5 driver faults. A big congratulations to Rebecca Yu. 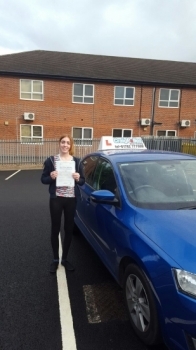 Rebecca passed her driving test today, at Newcastle Driving Test Centre and with just 3 driver faults. 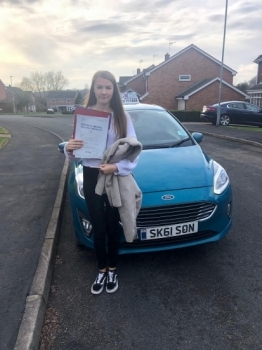 A big congratulations to Natasha Tomkinson. 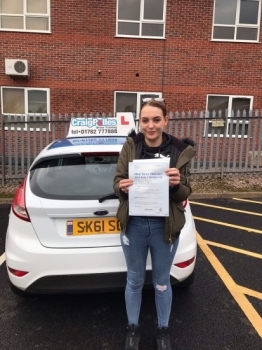 Natasha passed her driving test at Newcastle Driving Test Centre, at her first attempt. A big congratulations to Martha Davis. 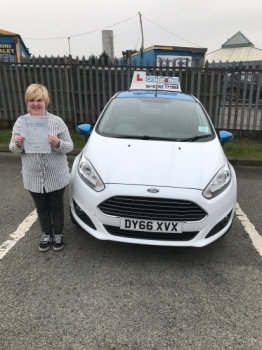 Martha passed her driving test today at Newcastle Driving Test Centre, at her first attempt. 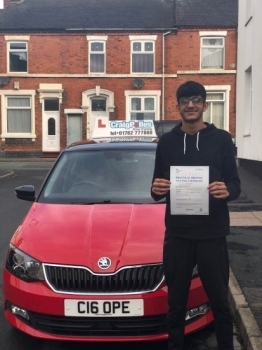 A big congratulations to Zain Ahmed. 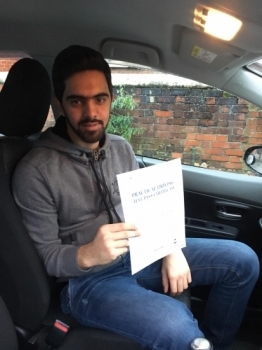 Zain passed his driving test today at Cobridge Driving Test Centre, with just 2 driver faults. A big congratulations to Qaisser Tikka. 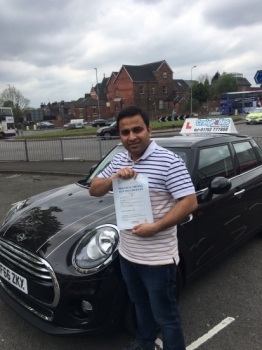 Qaisser passed his driving test today at Newcastle Driving Test Centre, first time and with just 3 driver faults. A big congratulations to Isabel Gallimore. 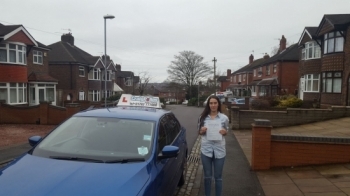 Isabel passed her driving test today at Newcastle Driving Test Centre, first time and with just 2 driver faults. I would like to say a big thank to Ashlee Kurian, he made the learning process fun and easy. 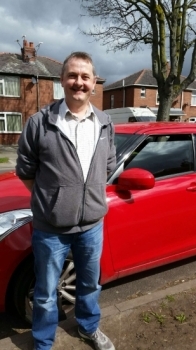 He's very patient and his teaching process sticks with you and makes you feel confident at driving. Thank you for all you support. A big congratulations to Arlene Joy. 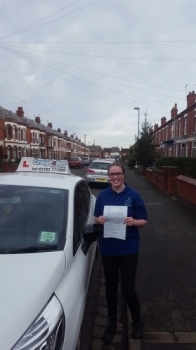 Arlene passed her driving test today, at Cobridge Driving Test Centre and with just 6 driver faults. A big congratulations to Harry Lake. Harry passed his driving test today at Newcastle Driving Test Centre, first time and with just 5 driver faults. A big congratulations to Dave Harrison. 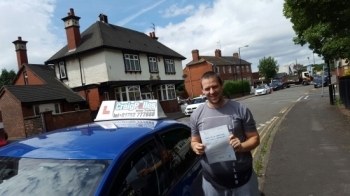 Dave passed his driving test today at Cobridge Driving Test Centre, first time and with just 6 driver faults. A big congratulations to Andrew Zuskowski. 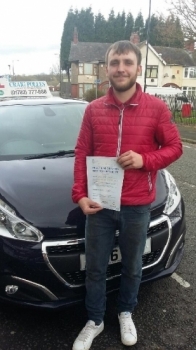 Andrew passed his driving test today at Newcastle Driving Test Centre, first time and with just 5 driver faults. A big congratulations to Merissa Baddeley. 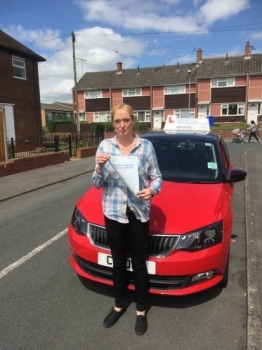 Merissa passed her driving test, at Newcastle Driving Test Centre and with just 4 driver faults. A big congratulations to Adam Chell. Adam passed his driving test today at Newcastle Driving Test Centre, first time and with just 5 driver faults. 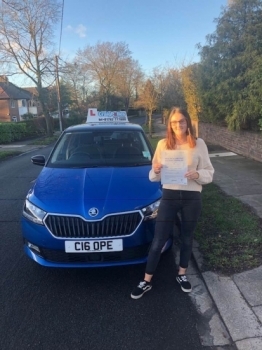 A big congratulations to Charlotte Pegg. 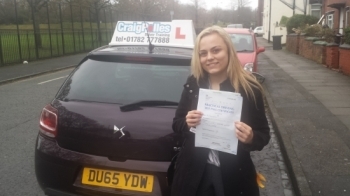 Charlotte passed her driving test today at Newcastle Driving Test Centre, first time and with just 6 driver faults. A big congratulations to Jake Rogerson. Jake passed his driving test today, at Cobridge Driving Test Centre first time and with just 4 driver faults. 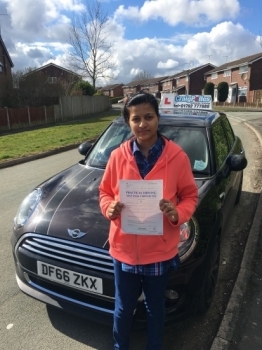 A big congratulations to Aaliyah Nawaz. 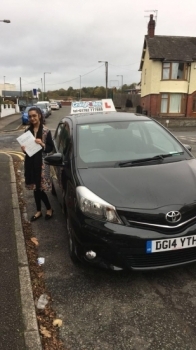 Aaliyah passed her driving test, at Newcastle Driving Test Centre and with just 2 driver faults. A big congratulations to Emily Johnson. 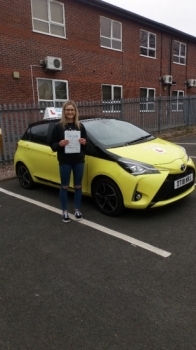 Emily passed her driving test today, at Newcastle Driving Test Centre first time and with 8 driver faults. A big congratulations to Lamar Mingo. 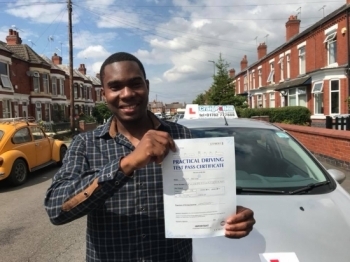 Lamar passed his driving test, at Cobridge Driving Test Centre first time and with just 3 driver faults. A big congratulations to Jisha Antony. 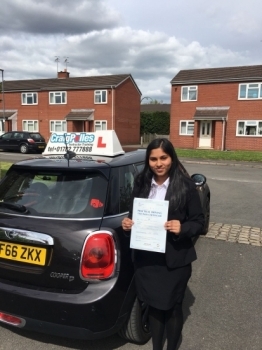 Jisha passed her driving test today, at Newcastle Driving Test Centre and with just 7 driver faults. 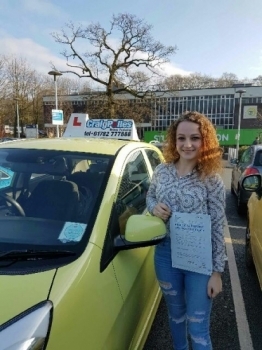 A big congratulations to Georgia Clarke. 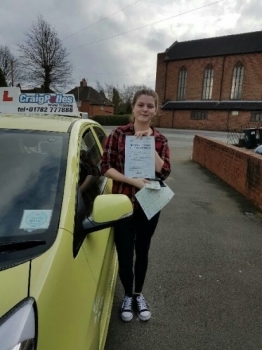 Georgia passed her driving test today, at Cobridge Driving Test Centre first time and with just 1 driver fault. 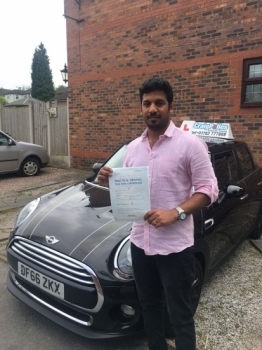 A big congratulations to Santhosh Jacob. 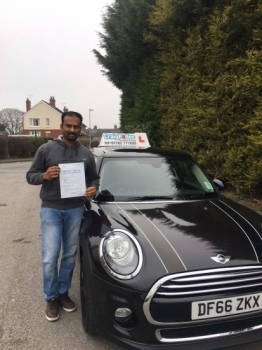 Santhosh passed his driving test today, at Buxton Driving Test Centre and with just 2 driver faults. 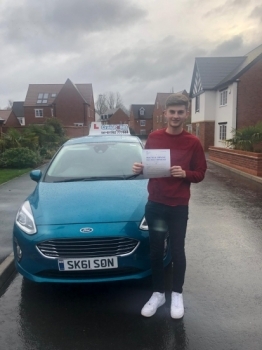 A big congratulations to Tom Pemberton. 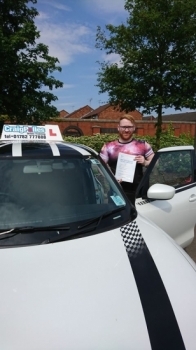 Tom passed his driving test at Crewe Driving Test Centre, and with just 3 driver faults. A big congratulations to Glynn Oldfield. 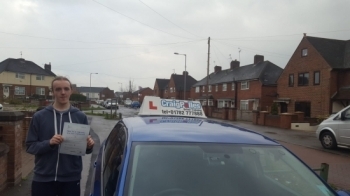 Glynn passed his driving test today, at Cobridge Driving Test Centre first time and with just 6 driver faults. A big congratulations to Matt Evans. 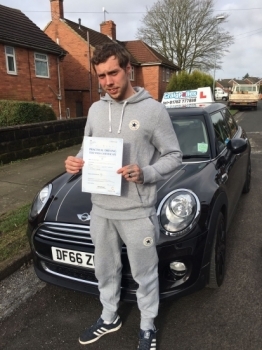 Matt passed his driving test at Newcastle Driving Test Centre today and with just 1 driver fault. A big congratulations to Radia Bibi. 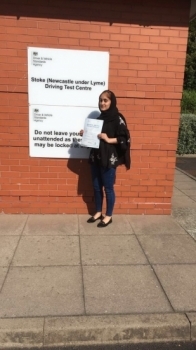 Radia passed her driving test at Newcastle Driving Test Centre. A big congratulations to Georgia Matthews. 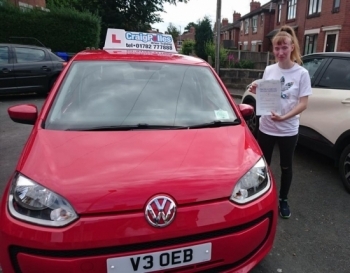 Georgia passed her driving test at Cobridge Driving Test Centre, first time and with just 6 driver faults. A big congratulations to James Sanderson. 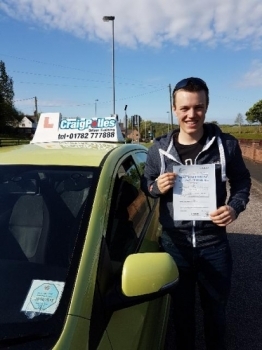 James passed his driving test today, at Newcastle Driving Test Centre with just 3 driver faults. 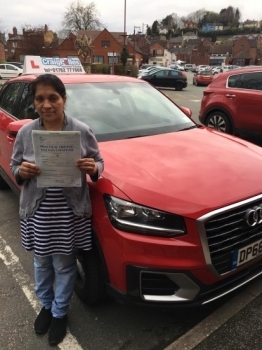 A big congratulations to Mrs Summaria Muneer. 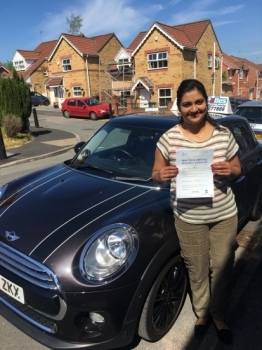 Mrs Summaria passed her driving test at Cobridge Driving Test Centre, with just 5 driver faults. 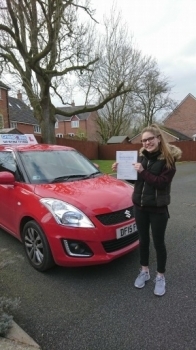 A big congratulations to Amy Rushton. 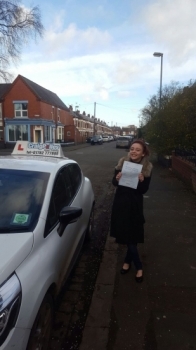 Amy passed her driving test today, at Newcastle Driving Test Centre with 8 driver faults. A big congratulations to Ryan Lench. Ryan passed his driving test today, at Newcastle Driving Test Centre first time and with just 1 driver fault. 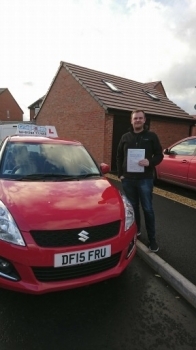 Thank you to my amazing driving instructor John Breeze. I wouldn't off passed if it wasn't for him. He is so patient and takes everything in your own stride. I will be recommending John to everyone. A big congratulations to Sam Moseley. 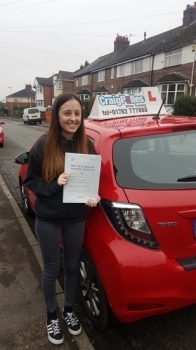 Sam passed her driving test today, at Crewe Driving Test Centre with 7driver faults. 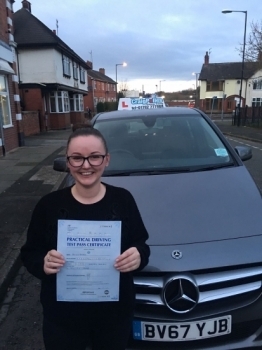 A big congratulations to Becci Shaw. 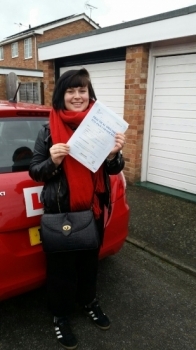 Becci passed her driving test today, at Newcastle Driving Test Centre with just 1 driver fault. 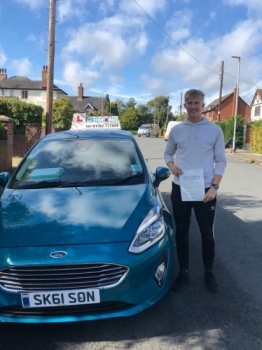 A big congratulations to Sam Billinge. 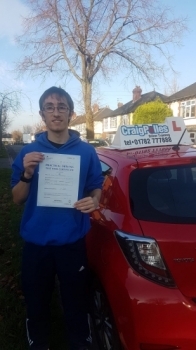 Sam passed his driving test today, at Cobridge Driving Test Centre first time and with just 5 driver faults. 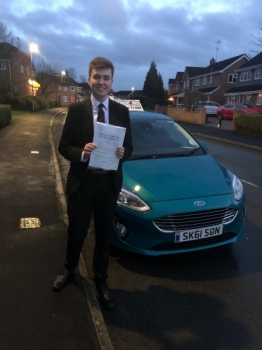 A big congratulations to Jack Gibson. 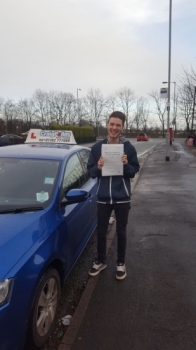 Jack passed his driving test today, at Newcastle Driving Test Centre with just 2 driver faults. A big congratulations to Luke Fenwick. 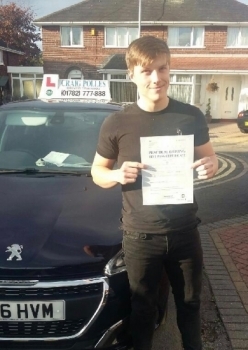 Luke passed his driving test today, at Newcastle Driving Test Centre with just 2 driver faults. A big congratulations to Yahna McCormick. 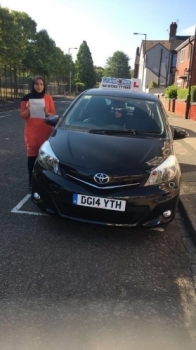 Yahna passed her driving test today, at Cobridge Driving Test Centre first time and with just 2 driver faults. 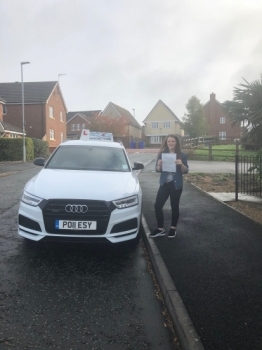 A big congratulations to Imogen Kelly. 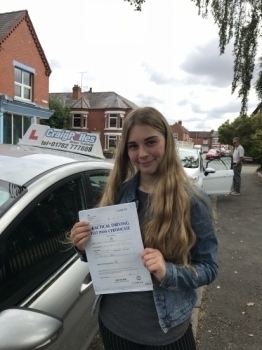 Imogen passed her driving test today, at Newcastle Driving Test Centre with just 2 driver faults. A big congratulations to Hannah Bailey. 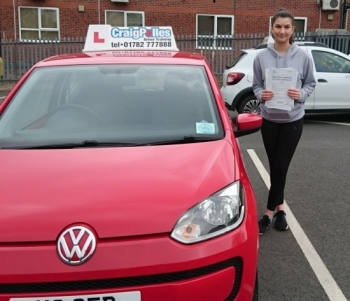 Hannah passed her driving test at Newcastle Driving Test Centre, with just 4 driver faults. A big congratulations to Fergus Meredith. 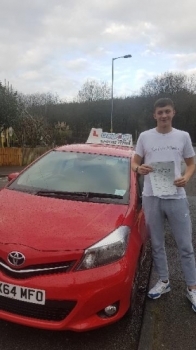 Fergus passed his driving test, at Newcastle Driving Test Centre first time and with just 6 driver faults. A big congratulations to Alex Gilson. 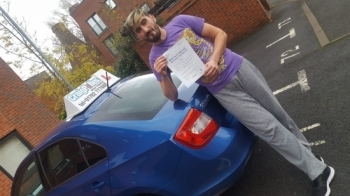 Alex passed his driving test at Newcastle Driving Test Centre, with just 4 driver faults. A big congratulations to a camera shy Sam Bailey. 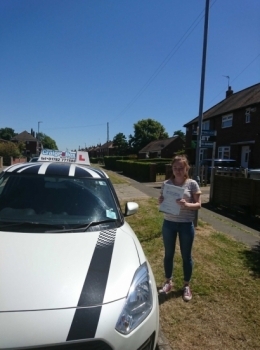 Sam passed her driving test at Cobridge Driving Test Centre, with just 1 driver fault. A big congratulations to Tyler Whittingham. 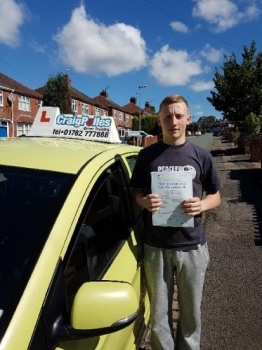 Tyler passed his driving test, at Cobridge Driving Test Centre first time and with just 2 driver faults. A big congratulations to Anna Johnson. 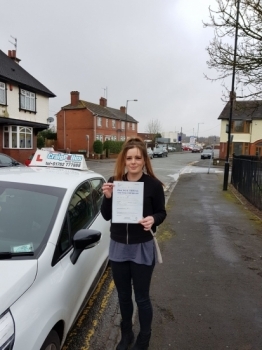 Anna passed her driving test, at Crewe Driving Test Centre first time and with just 2 driver faults. 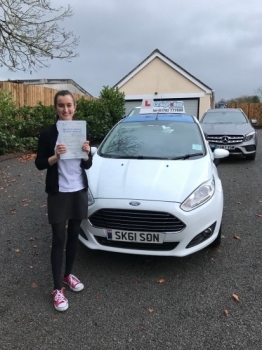 A big congratulations to Saskia Fagan. 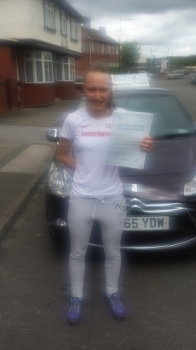 Saskia passed her driving test today, at Newcastle Driving Test Centre first time and with just 5 driver faults. 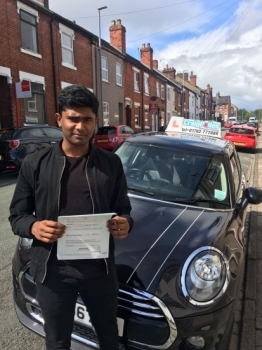 A big congratulations to Zeshan Hanif. 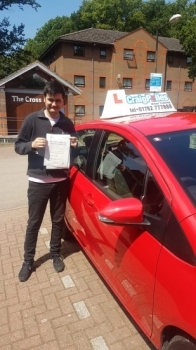 Zeshan passed his driving test at Cobridge Driving Test Centre, with just 3 driver faults. 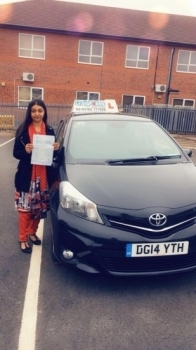 A big congratulations to Uzma Afsar. 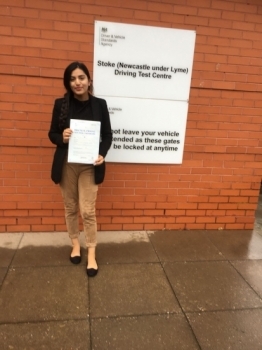 Uzma passed her driving test at Newcastle Driving Test Centre, with 9 driver faults. A big congratulations to a camera shy Kelly Brindley. 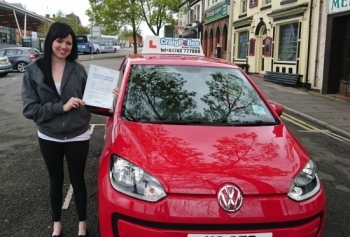 Kelly passed her driving test at Newcastle Driving Test Centre, with just 6 driver faults. A big congratulations to Grahame Boswell. 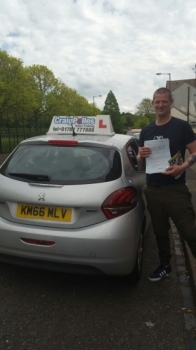 Grahame passed his driving test, at Cobridge Driving Test Centre with 8 driver faults. A big congratulations to Jack Foster. 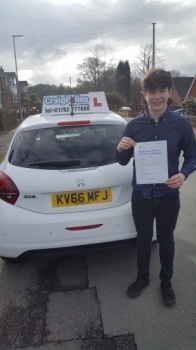 Jack passed his driving test today, at Cobridge Driving Test Centre first time and with just 7 driver faults. A big congratulations to Amy Hammond. 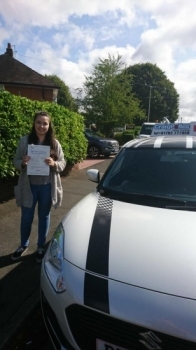 Amy passed her driving test today, at Newcastle Driving Test Centre first time and with just 6 driver faults. A big congratulations to Niall Sephton. 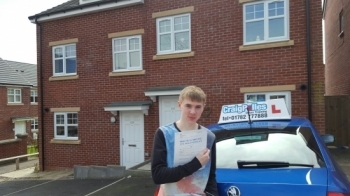 Niall passed his driving test today, at Newcastle Driving Test Centre with just 1 driver fault. 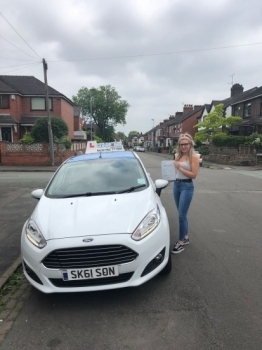 A big congratulations to Beth Askey. 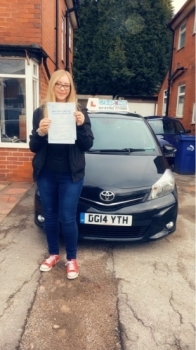 Beth passed her driving test, at Cobridge Driving Test Centre with 5 driver faults. A big congratulations to Elijah Wells. 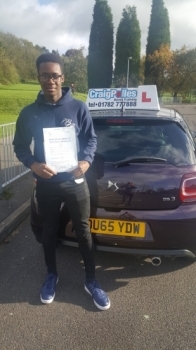 Elijah passed his driving test today, at Newcastle Driving Test Centre with 7 driver faults. 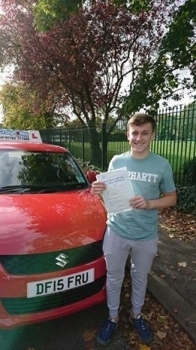 A big congratulations to Charley Ball. 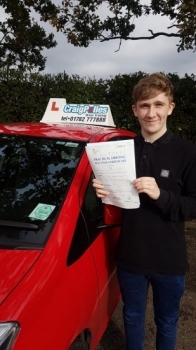 Charley passed his driving test today, at Cobridge Driving Test Centre with 2 driver faults. A big congratulations to Darcy Locker. 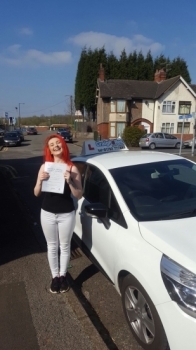 Darcy passed her driving test today, at Cobridge Driving Test Centre with 0 driver faults - A clean sheet! A big congratulations to Megan Ashley. 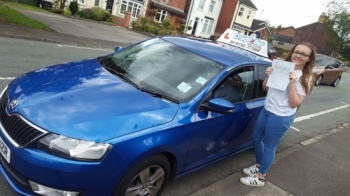 Megan passed her driving test today, at Newcastle Driving Test Centre first time and with just 7 driver faults. A big congratulations to Alan Tharme. 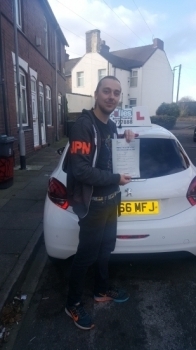 Alan passed his driving test today, at Newcastle Driving Test Centre with 7 driver faults. 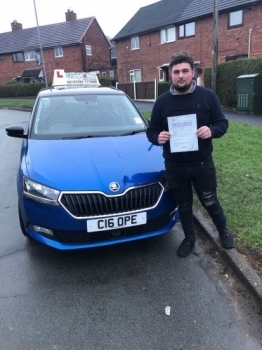 A big congratulations to Callum Pugh. 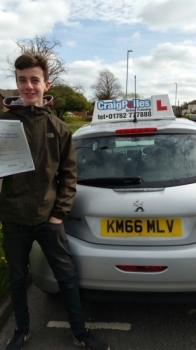 Callum passed his driving test today, at Cobridge Driving Test Centre with just 1 driver fault. A big congratulations to Jei Smith . 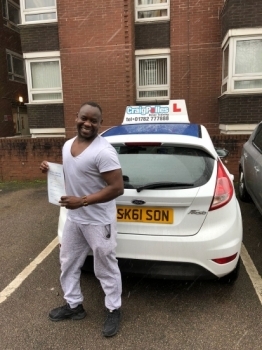 Jei passed his driving test today, at Newcastle Driving Test Centre with just 4 driver faults. A big congratulations to Rachel Lee. 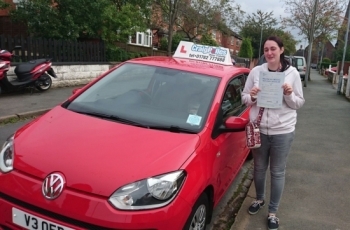 Rachel passed her driving test today, at Newcastle Driving Test Centre with just 5 driver faults. A big congratulations to David Sillitto. 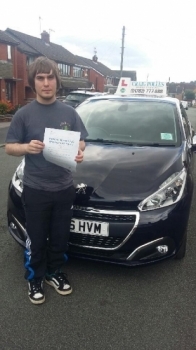 David passed his driving test, at Newcastle Driving Test Centre with 5 driver faults. A big congratulations to Kerry Cole. 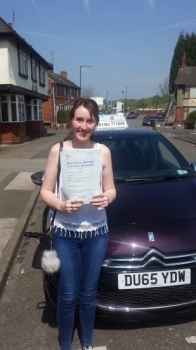 Kerry passed her driving test today, at Newcastle Driving Test Centre with 8 driver faults. 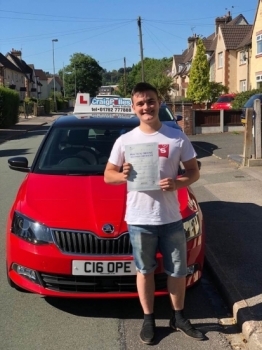 A big congratulations to Ben Cresswell. 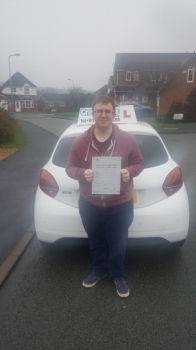 Ben passed his driving test today, at Crewe Driving Test Centre with just 5 driver faults. A big congratulations to a camera shy Hannah Mountford. 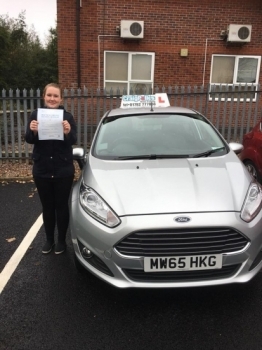 Hannah passed her driving test at Newcastle Driving Test Centre, first time and with just 6 driver faults. 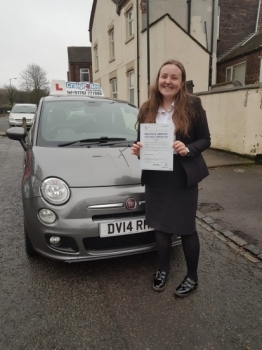 A big congratulations to Sophie Goodfellow. 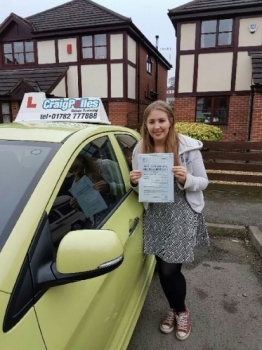 Sophie passed her driving test today, at Cobridge Driving Test Centre with just 1 driver fault. 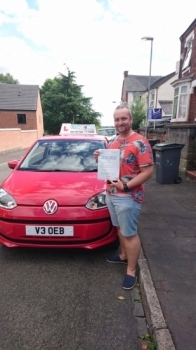 A big congratulations to Adam Jeffery. 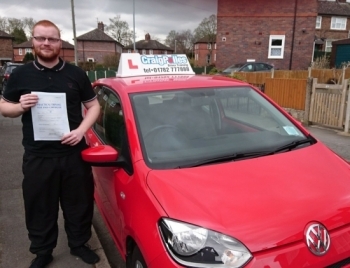 Adam passed his driving test today, at Newcastle Driving Test Centre first time and with just 2 driver faults. A big congratulations to Leon Eaton. 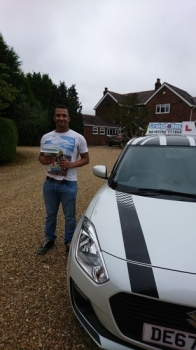 Leon passed his driving test today, at Cobridge Driving Test Centre first time and with just 3 driver faults. A big congratulations to Oliver Jones. 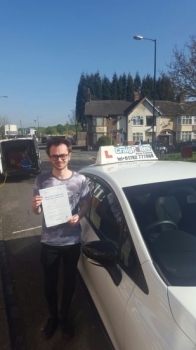 Oliver passed his driving test today, at Cobridge Driving Test Centre with just 6 driver faults. A big congratulations to Corey Nelson. 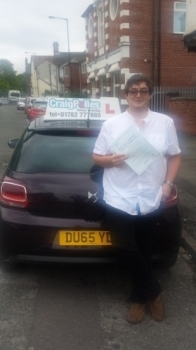 Corey passed his driving test today, at Newcastle Driving Test Centre first time and with just 5 driver faults. A big congratulations to Robin Joy. 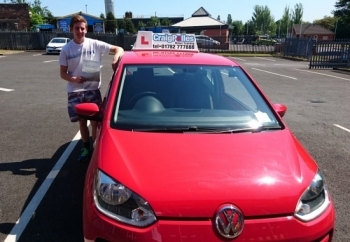 Robin passed his driving test today, at Newcastle Driving Test Centre first time and with just 6 driver faults. 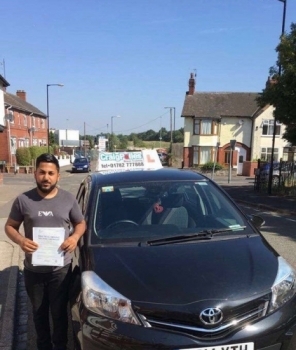 A big congratulations to Mohammed Suleman. 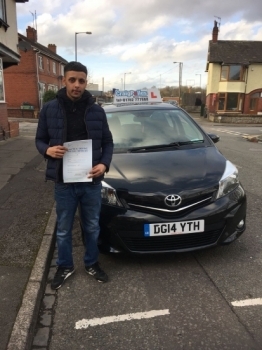 Mohammed passed his driving test today, at Cobridge Driving Test Centre first time and with just 2 driver faults. A big congratulations to Karl Morley. 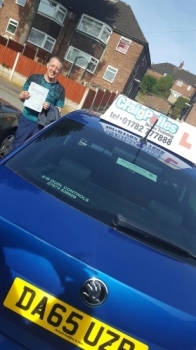 Karl passed his driving test today, at Cobridge Driving Test Centre first time and with just 5 driver faults. A big congratulations to Kim Vyse . 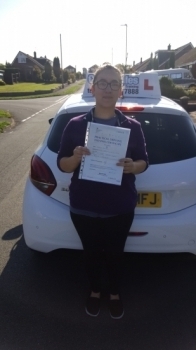 Kim passed her driving test today, at Cobridge Driving Test Centre first time and with just 4 driver faults. A big congratulations to Haley Scott. 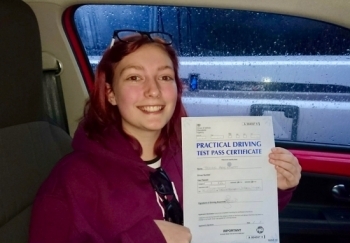 Haley passed her driving test today, at Newcastle Driving Test Centre first time and with just 3 driver faults. A big congratulations to Kerry Watson. 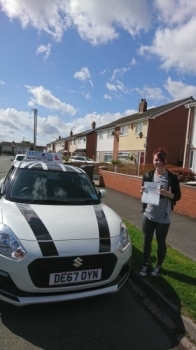 Kerry passed her driving test today, at Newcastle Driving Test Centre first time and with 9 driver faults. A big congratulations to Laura Woch. 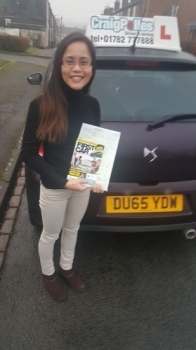 Laura passed her driving test today, at Cobridge Driving Test Centre with just 6 driver faults. A big congratulations to Khalid Jones. 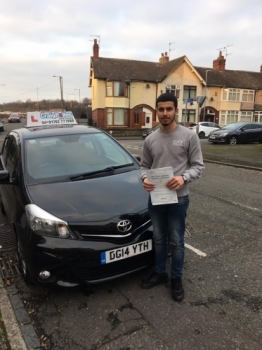 Khalid passed his driving test today, at Cobridge Driving Test Centre first time and with just 2 driver faults. A big congratulations to Katie Holt. 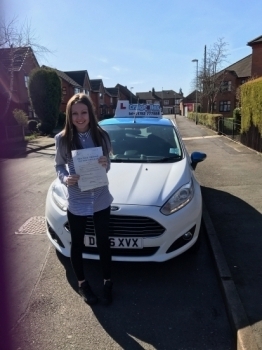 Katie passed her driving test today, at Cobridge Driving Test Centre first time and with just 5 driver faults. 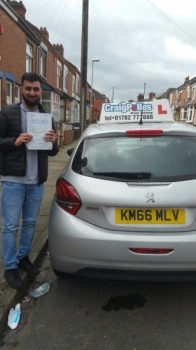 A big congratulations to Sharif Khalily. 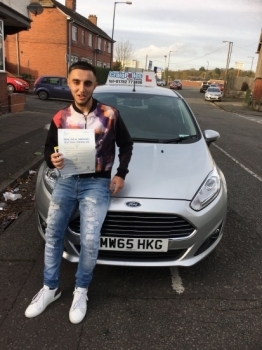 Sharif passed his driving test today, at Cobridge Driving Test Centre first time and with just 6 driver faults. A big congratulations to Martin Jose. 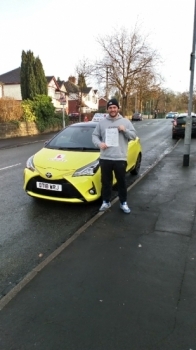 Martin passed his driving test today, at Buxton Driving Test Centre with 7 driver faults. 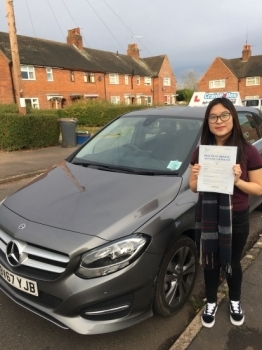 A big congratulations to Ngoc Pham Thanh. 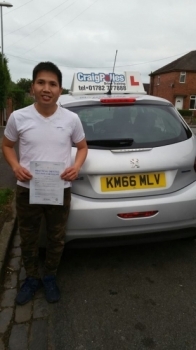 Ngoc passed his driving test today, at Newcastle Driving Test Centre. A big congratulations to Shauna Robinshaw. 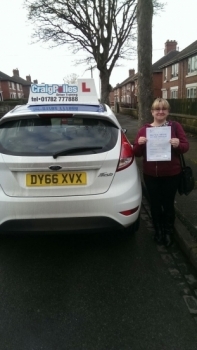 Shauna passed her driving test today, at Newcastle Driving Test Centre with just 5 driver faults. 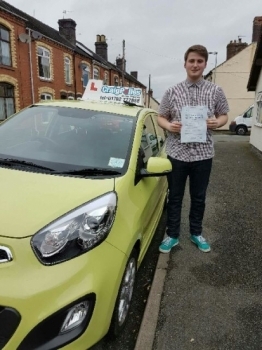 A big congratulations to Rhys Nichols. 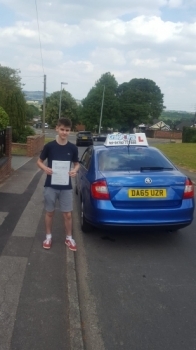 Rhys passed his driving test today, at Cobridge Driving Test Centre first time and with just 5 driver faults. 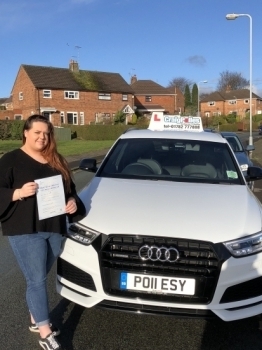 A big congratulations to Becky Sims. 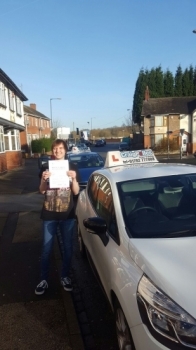 Becky passed her driving test today, at Cobridge Driving Test Centre with just 5 driver faults. 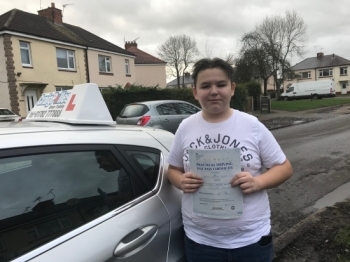 A big congratulations to Jack Davies. 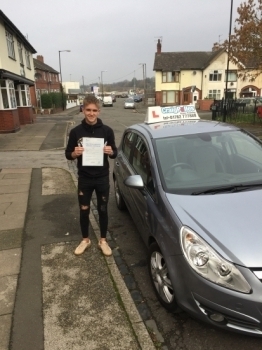 Jack passed his driving test today, at Newcastle Driving Test Centre with just 5 driver faults. 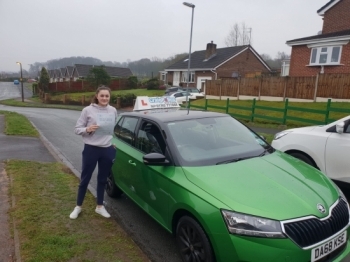 A big congratulations to Niamh Leyland. 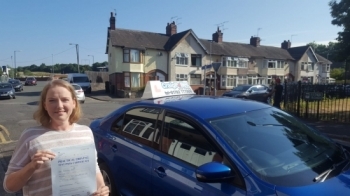 Niamh passed her driving test, at Cobridge Driving Test Centre with just 2 driver faults. A big congratulations to Ady Sargent. 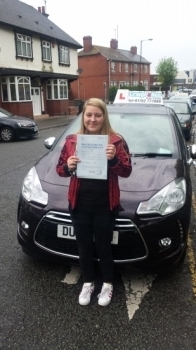 Ady passed her driving test today, at Newcastle Driving Test Centre with just 2 driver faults. 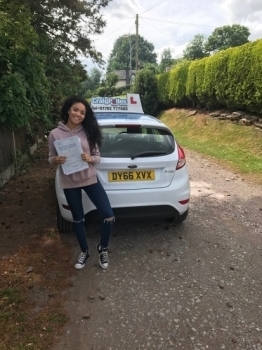 A big congratulations to Demi Walker. 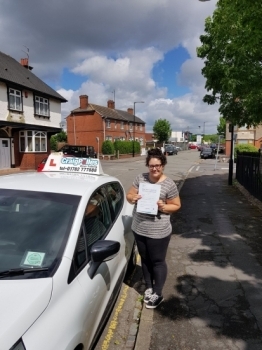 Demi passed her driving test, at Cobridge Driving Test Centre with just 5 driver faults. 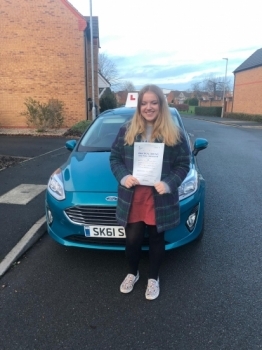 A big congratulations to Rebecca Viles. 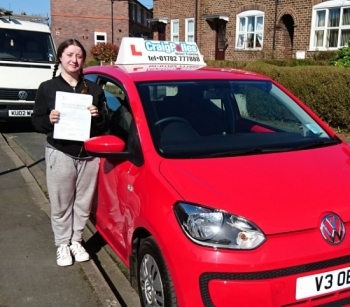 Rebecca passed her driving test, at Newcastle Driving Test Centre with just 1 driver fault. 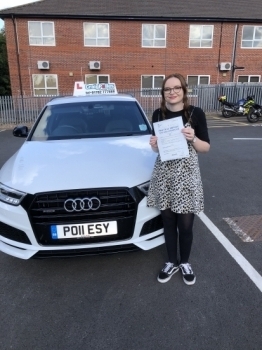 A big congratulations to Amelia Eardley . 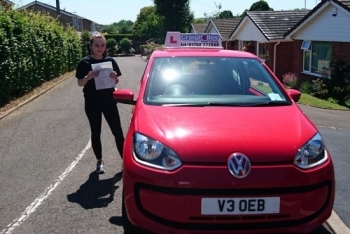 Amelia passed her driving test today, at Cobridge Driving Test Centre first time and with just 1 driver fault. A big congratulations to Kerain Boden. 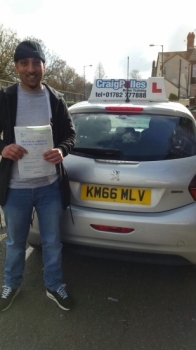 Kerain passed his driving test today, at Cobridge Driving Test Centre with just 5 driver faults. 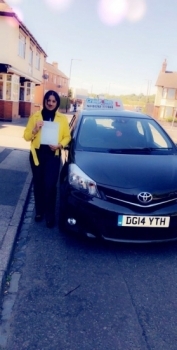 A big congratulations to Safa Mohammad. 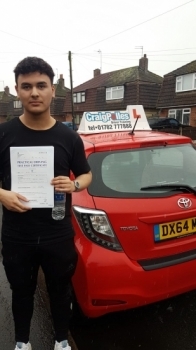 Safa passed his driving test today, at Cobridge Driving Test Centre with just 2 driver faults. A big congratulations to Greg Rowley. 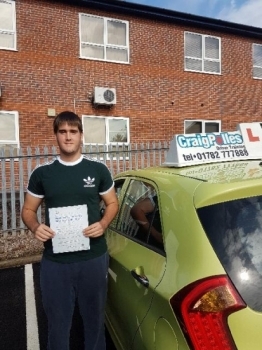 Greg passed his driving test today, at Cobridge Driving Test Centre first time and with just 3 driver faults. A big congratulations to Rachel Saville. 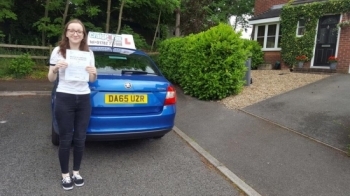 Rachel passed her driving test today, at Cobridge Driving Test Centre with just 1 driver fault. 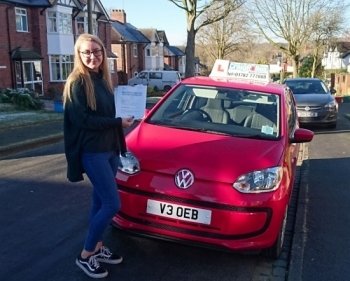 A big congratulations to Isobelle Webster. 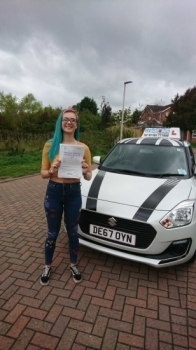 Isabelle passed her driving test, at Cobridge Driving Test Centre. 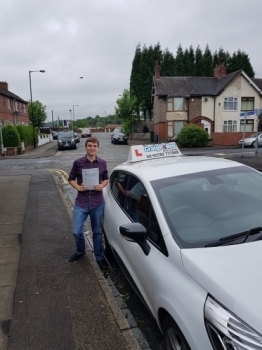 Very happy with the lessons from Stephen and passed first time, thank you for all the help along the way! A big congratulations to Paige Dale Denton . 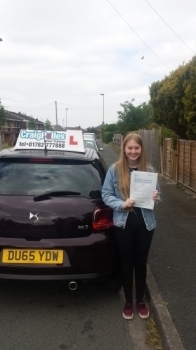 Paige passed her driving test today, at Cobridge Driving Test Centre first time and with just 3 driver faults. 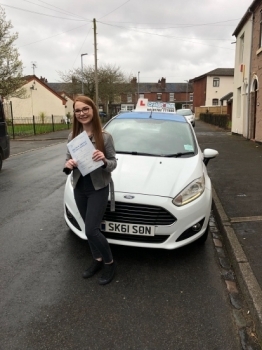 A big congratulations to Bethany Clough. 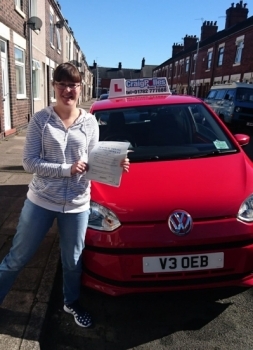 Beth passed her driving test, at Newcastle Driving Test Centre with just 3 driver faults. A big congratulations to Andrew Atkinson. 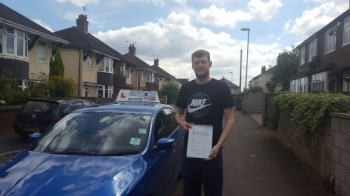 Andrew passed his driving test, at Cobridge Driving Test Centre with just 6 driver faults. A big congratulations to Kyle Crawford. 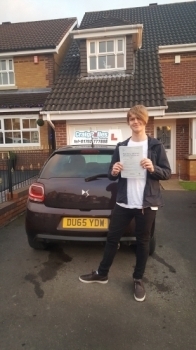 Kyle passed his driving test today, at Newcastle Driving Test Centre, first attempt and with just 3 driver faults. A big congratulations to Lauren Green . 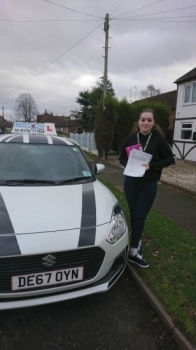 Lauren passed her driving test today, at Cobridge Driving Test Centre first time and with just 5 driver faults. A big congratulations to Sam Davies . 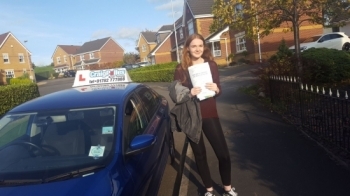 Sam passed her driving test today, at Newcastle Driving Test Centre first time and with just 7 driver faults. 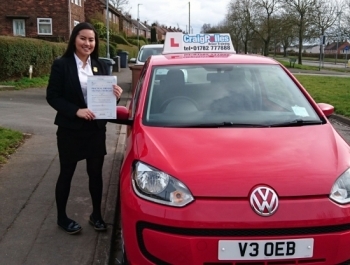 A big congratulations to Charlotte Birks . 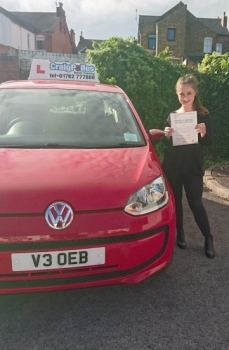 Charlotte passed her driving test today, at Cobridge Driving Test Centre first time and with just 5 driver faults. A big congratulations to Ryan Hughes. Ryan passed his driving test today, at Cobridge Driving Test Centre first time and with just 1 driver fault. 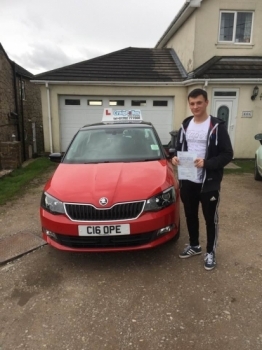 A big congratulations to Callum Hulme. 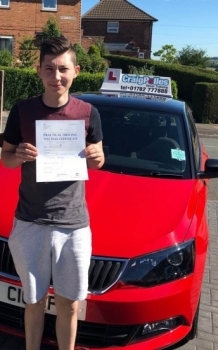 Callum passed his driving test, at Cobridge Driving Test Centre with just 3 driver faults. A big congratulations to Kavitha Pai. 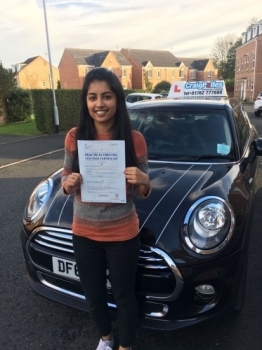 Kavitha passed her driving test today, at Newcastle Driving Test Centre with just 5 driver faults. A big congratulations to Caitlin Heath. 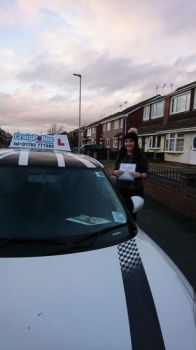 Caitlin passed her driving test today, at Cobridge Driving Test Centre first time and with just 6 driver faults. 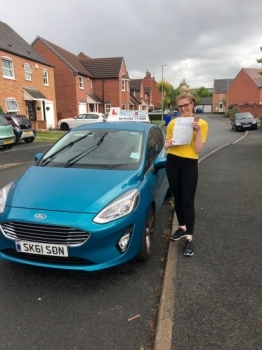 A big congratulations to Beth Colclough. 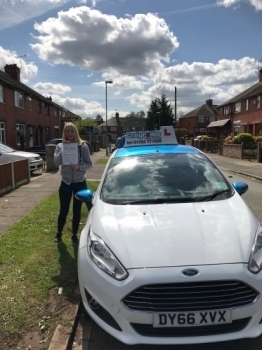 Beth passed her driving test today, at Cobridge Driving Test Centre with 8 driver faults. A big congratulations to Nivin Jose. 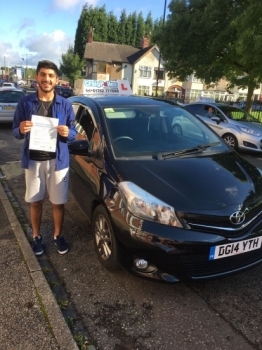 Nivin passed his driving test, at Cobridge Driving Test Centre with just 6 driver faults. A big congratulations to Charlie Horner. 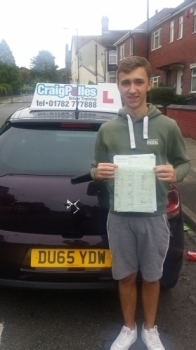 Charlie passed his driving test today, at Newcastle Driving Test Centre with just 2 driver faults. 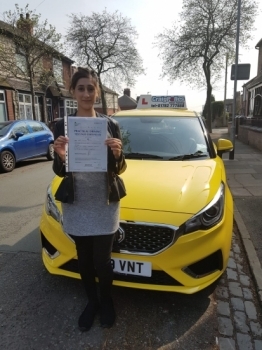 A big congratulations to Hafsa Etarghi. 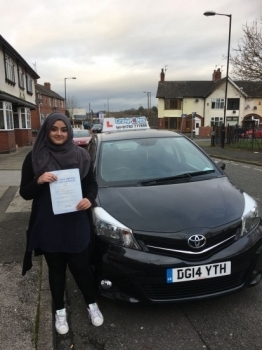 Hafsa passed her driving test today, at Cobridge Driving Test Centre with just 1 driver fault. A big congratulations to Antony Beardmore. 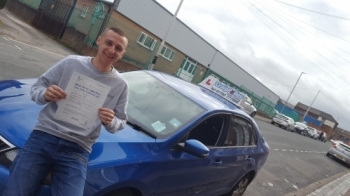 Antony passed his driving test today, at Newcastle Driving Test Centre with just 2 driver faults. A big congratulations to Sam Davey. 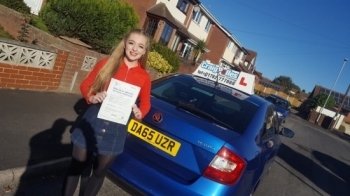 Sam passed her driving test today, at Newcastle Driving Test Centre first time and with just 5 driver faults. A big congratulations to Nichole Atherton. 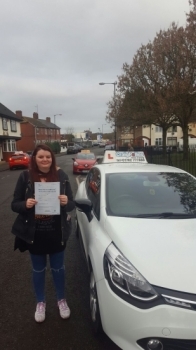 Nichole passed her driving test today, at Cobridge Driving Test Centre first time and with just 2 driver faults. 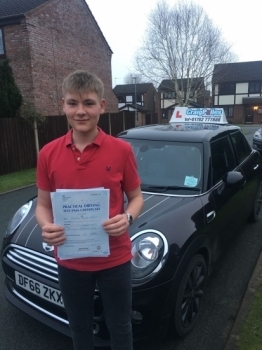 A big congratulations to Callum Mountford. 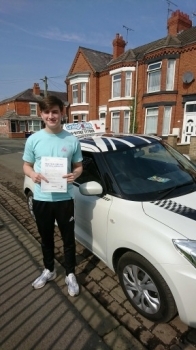 Callum passed his driving test today, at Newcastle Driving Test Centre, with just 3 driver faults. driving test today, at Cobridge Driving Test Centre, with just 2 driver faults. 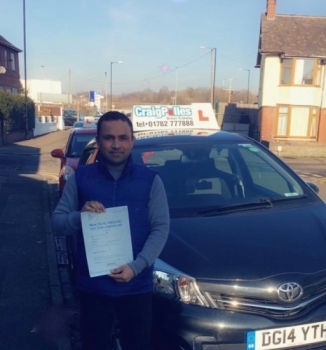 A big congratulations to Sediq Khan. 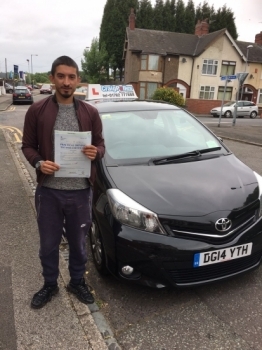 Sediq passed his driving test today, at Cobridge Driving Test Centre first time and with just 4 driver faults. 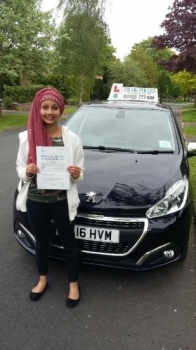 A big congratulations to Salma Hussein Albakri. 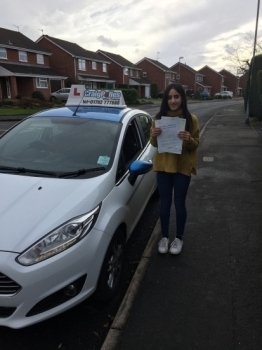 Salma passed her driving test today, at Cobridge Driving Test Centre first time and with just 4 driver faults. 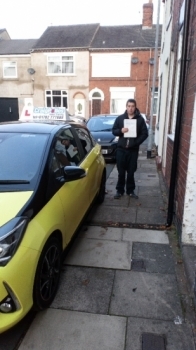 driving test today, at Crewe Driving Test Centre first time and with just 4 driver faults. A big congratulations to Collette Watkin. 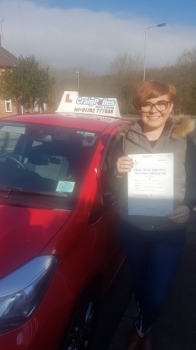 Collette passed her driving test today, at Newcastle Driving Test Centre, with just 2 driver faults. driving test today, at Cobridge Driving Test Centre first time and with just 3 driver faults. driving test today, at Newcastle Driving Test Centre first time and with just 3 driver faults. driving test today, at Cobridge Driving Test Centre first time and with just 1 driver fault. Clear & patient tuition which was what I'd hoped for. Pass at first attempt is testimony to that also - thanks. 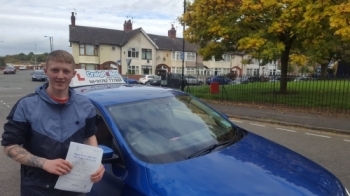 driving test today, at Crewe Driving Test Centre first time and with just 6 driver faults. 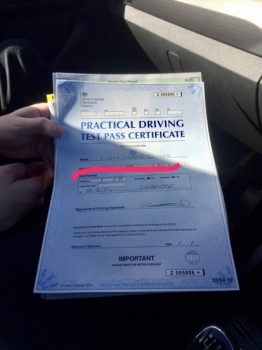 driving test today, at Crewe Driving Test Centre, with just 4 driver faults. driving test today, at Cobridge Driving Test Centre first time and with just 4 driver faults. A big congratulations to Georgo Blesson. 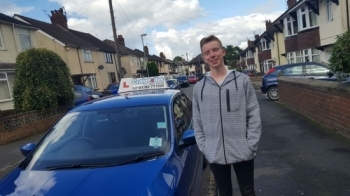 Georgo passed his driving test today, at Cobridge Driving Test Centre first time and with just 1 driver fault. Jamie Lees is an excellent driving coach. 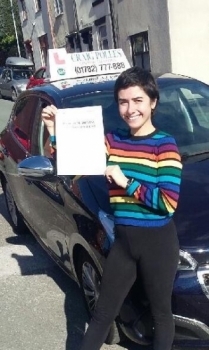 I took my driving test with confidence and feeling relaxed. I highly recommend. driving test today, at Cobridge Driving Test Centre first time and with just 6 driver faults. driving test today, at Cobridge Driving Test Centre first time and with just 5 driver faults. driving test today, at Newcastle Driving Test Centre first time and with 7 driver faults. driving test today, at Cobridge Driving Test Centre with 7 driver faults. driving test today, at Newcastle Driving Test Centre with just 4 driver faults. driving test today, at Cobridge Driving Test Centre with just 3 driver faults. driving test today, at Cobridge Driving Test Centre with just 5 driver faults. driving test today, at Cobridge Driving Test Centre with just 1 driver fault. 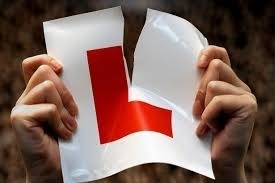 driving test today, at Cobridge Driving Test Centre first time and with just 7 driver faults. driving test today, at Newcastle Driving Test Centre with just 3 driver faults. driving test today, at Newcastle Driving Test Centre. driving test today at Newcastle Driving Test Centre. First time and with just 3 driver faults. 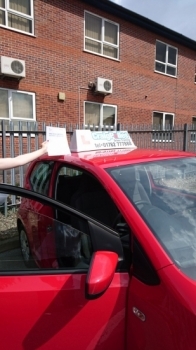 driving test today, at Crewe Driving Test Centre with just 4 driver faults. 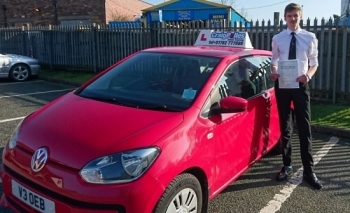 driving test, at Newcastle Driving Test Centre with just 5 driver faults. 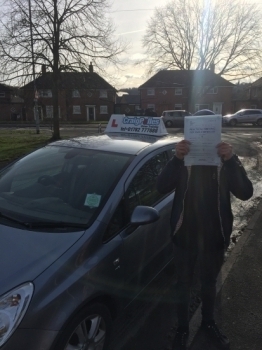 driving test, at Cobridge Driving Test Centre with just 6 driver faults. driving test today at Cobridge Driving Test Centre. First time and with just 2 driver faults. 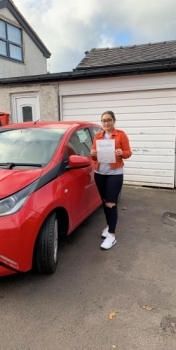 driving test at Cobridge Driving Test Centre. First time and with 0 driver faults. driving test today at Newcastle Driving Test Centre. First time and with just 2 driver faults. 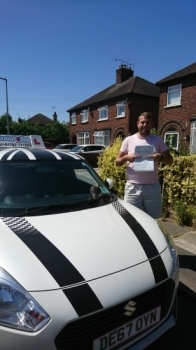 Big thanks to Mark Ashley who helped me pass my test last Friday. Fantastic instructor, fantastic bloke! driving test today at Newcastle Driving Test Centre. First time and with just 1 driver fault. 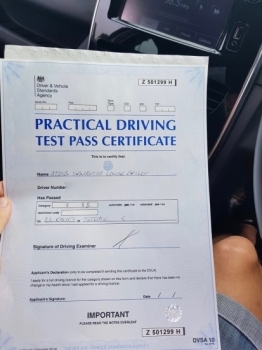 driving test, at Newcastle Driving Test Centre with just 4 driver faults. 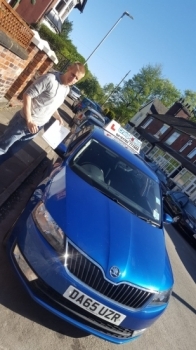 Had my lessons in Crewe/Nantwich with John. A great instructor, who is a excellent teacher and works hard to get you to your strongest ability for your test. driving test today at Crewe Driving Test Centre. First time and with just 8 driver faults. driving test today, at Newcastle Driving Test Centre with just 1 driver fault. driving test today at Crewe Driving Test Centre. First time and with just 6 driver faults. driving test today at Cobridge Test Centre. First time and with just 1 driver fault. driving test today at Cobridge Test Centre. First time and with just 3 driver faults. driving test today at Cobridge Test Centre. First time and with just 4 driver faults. Great company, great instructers, would highly recommend! driving test today, at Cobridge Test Centre with just 7 driver faults. driving test today, at Newcastle Test Centre with just 5 driver faults. driving test today at Newcastle Test Centre. First time and with just 8 driver faults.